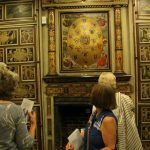 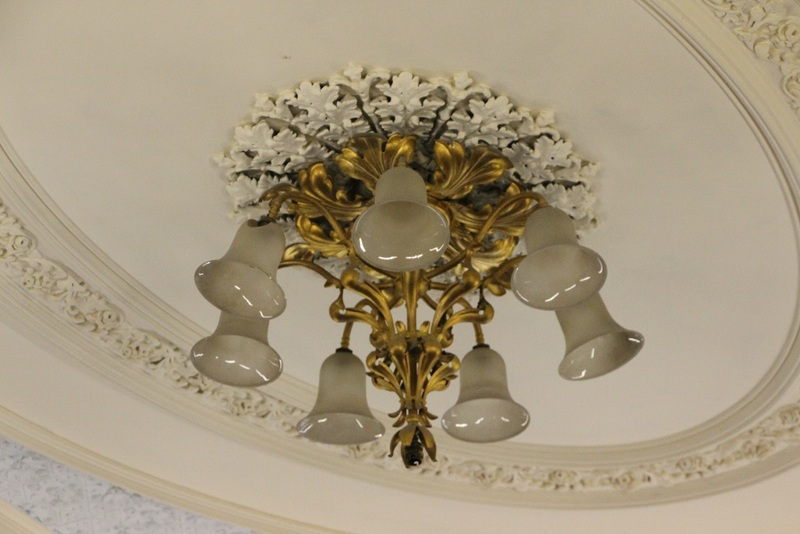 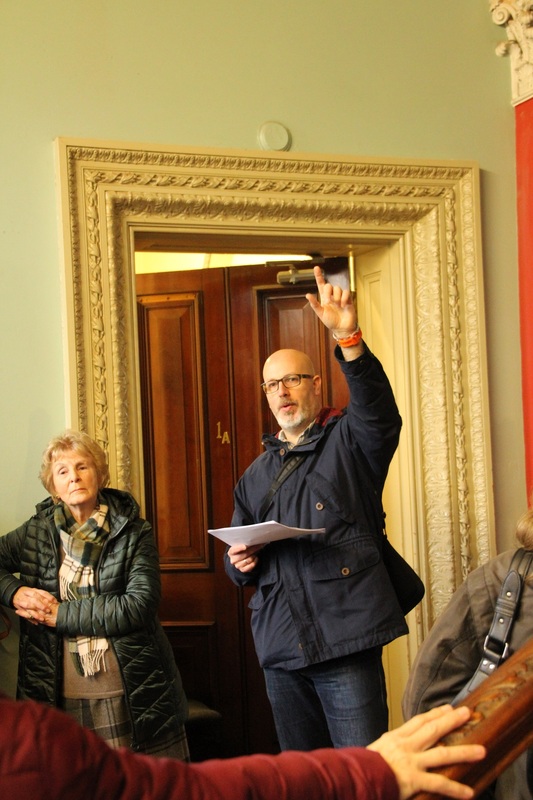 Here's a selection of photos from our most recent events, exhibitions, visits, walks and talks. 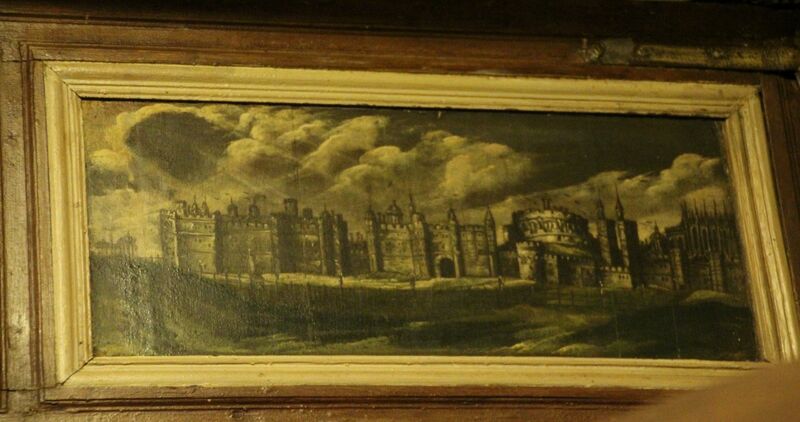 Just click on an image to enlarge it. 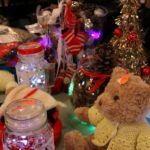 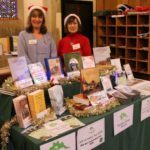 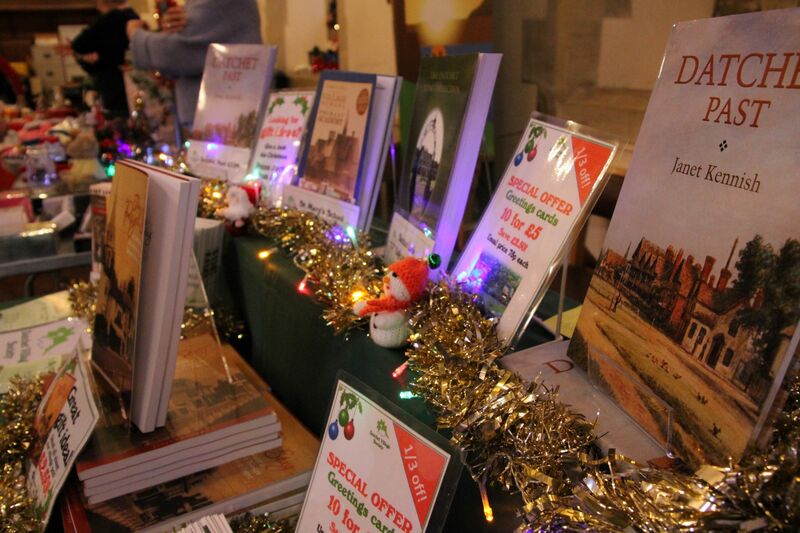 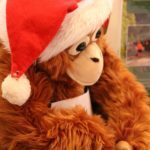 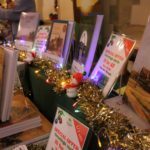 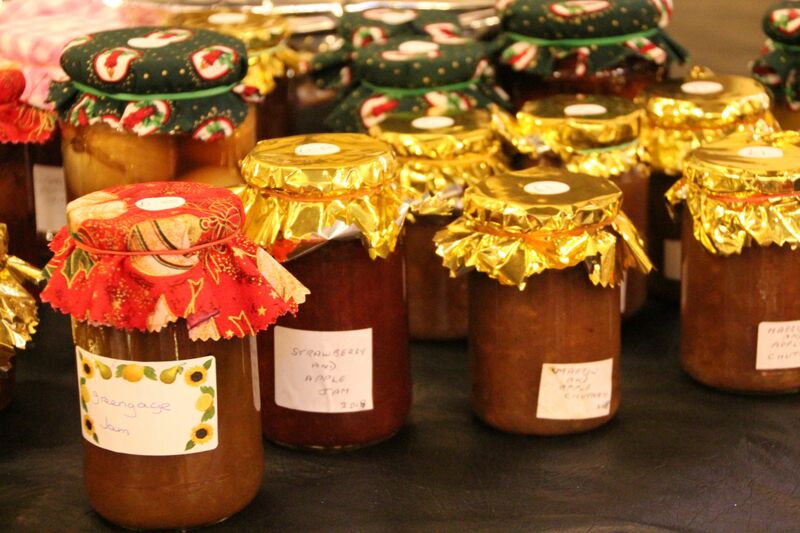 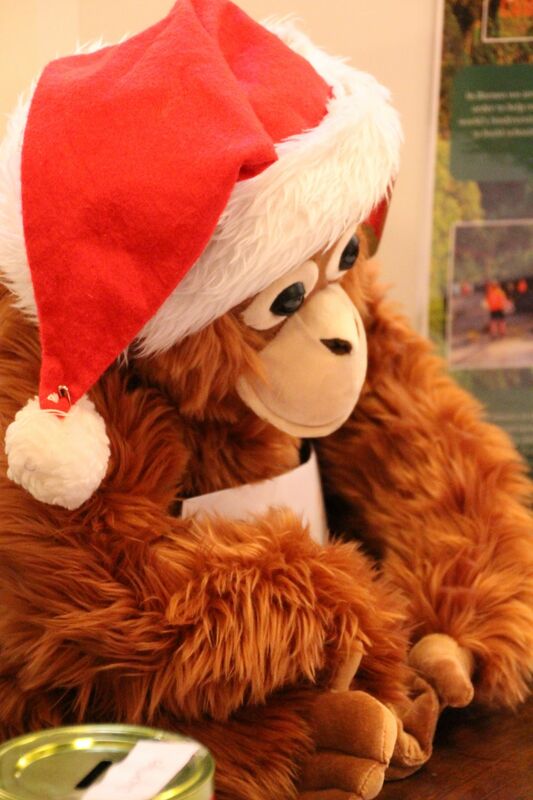 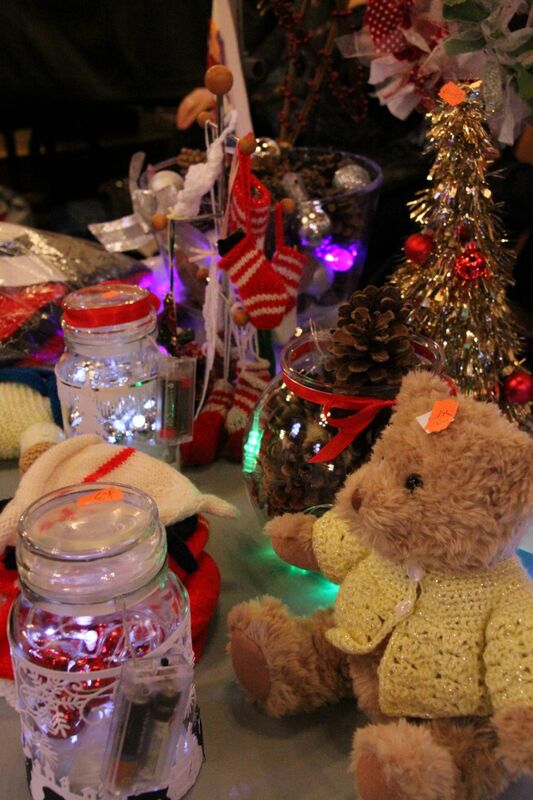 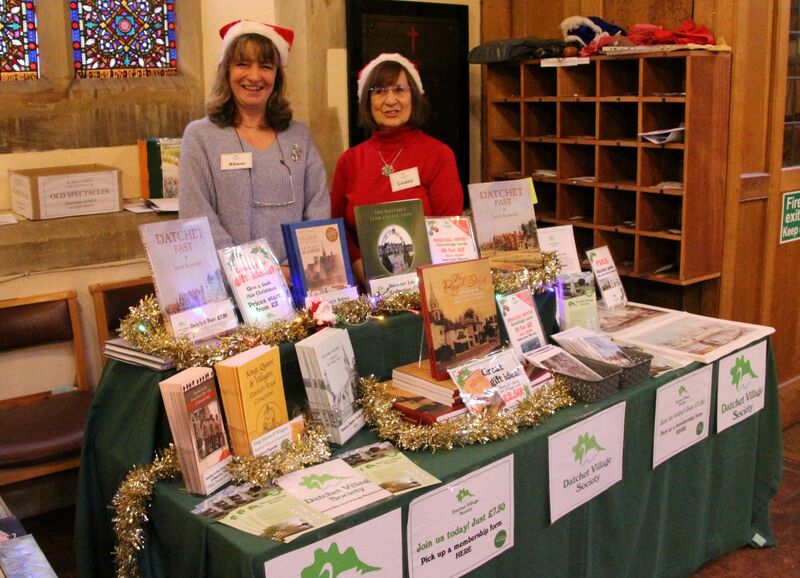 DVS had a stall at the St Nicholas Fayre this year, one of the ‘Christmas on the Green’ events of 1 December. 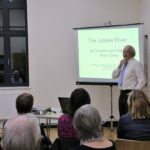 Thank you to everyone who came along. 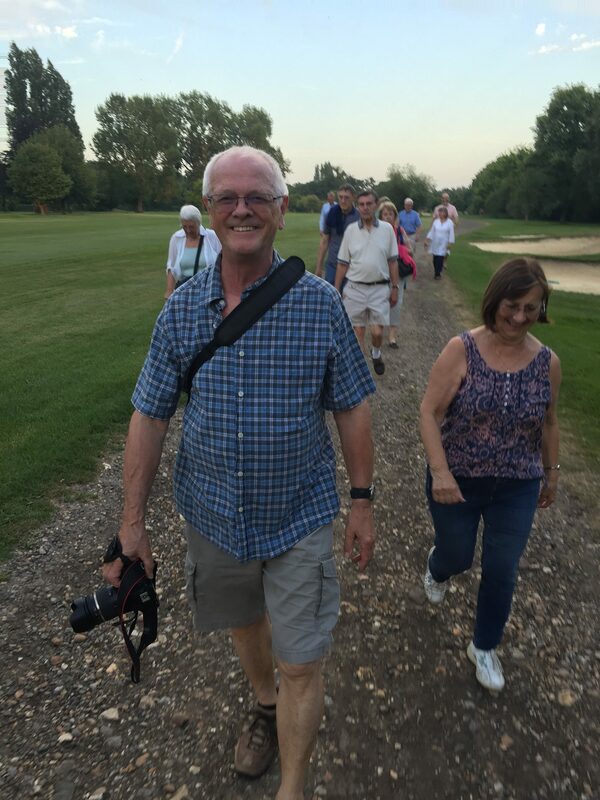 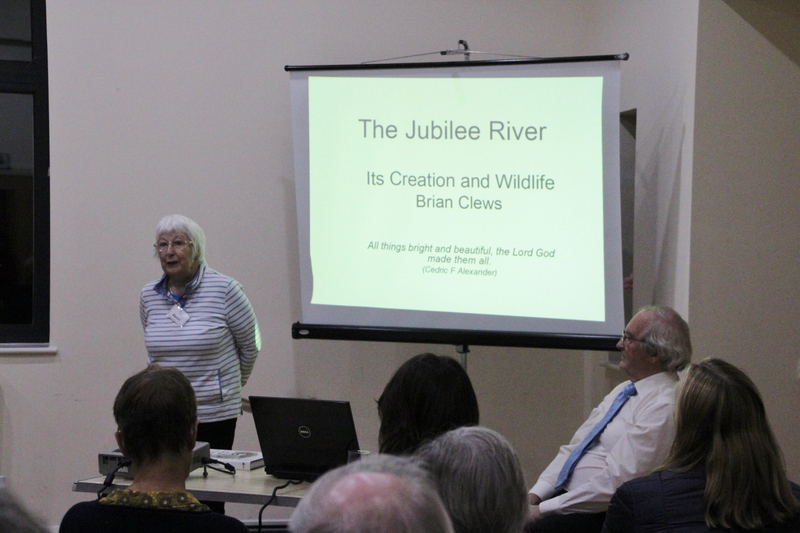 On 15 November 2018, we invited Brian Clews to talk to us about the wildlife on the Jubilee River. 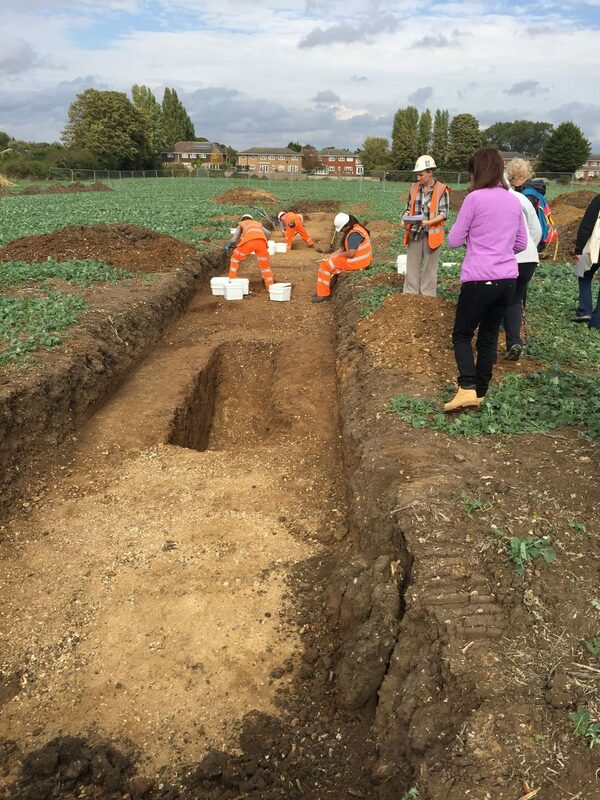 Brian has vast experience in this area. 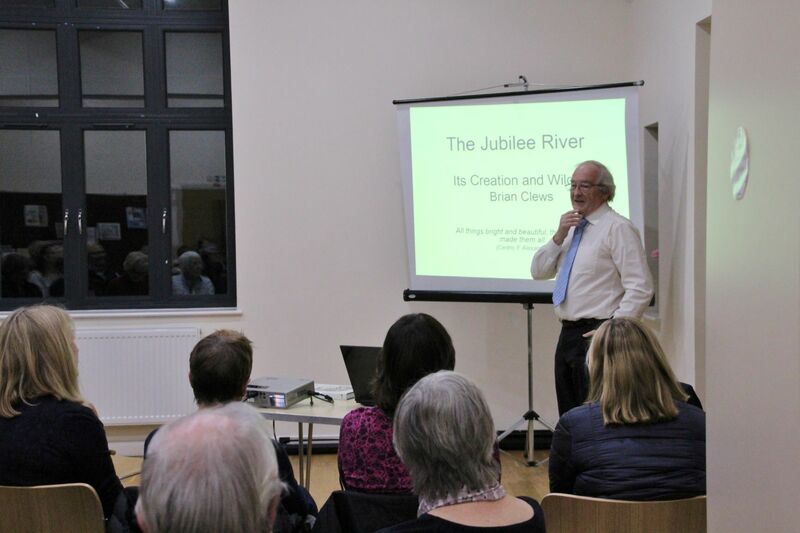 After the Jubilee River was built in 2000, he surveyed both banks of the entire river every week for 10 years until the funding ran out. 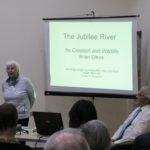 When the new River Thames Scheme from Datchet to Teddington was proposed, the Environment Agency had no up-to-date survey data on the Jubilee River so they asked again for Brian’s help. 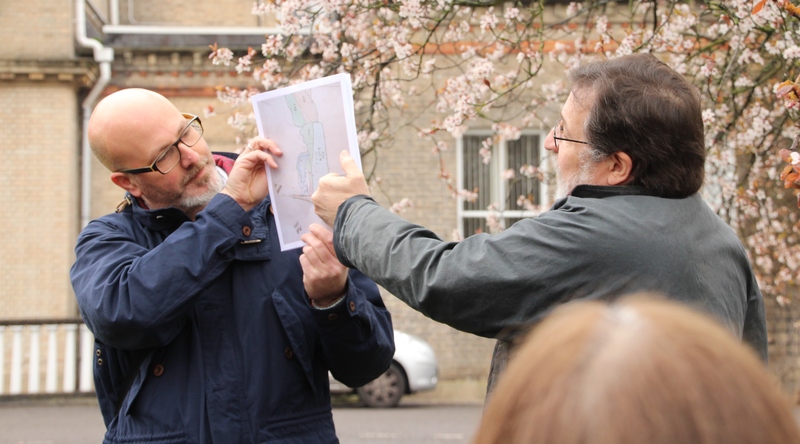 Brian surveyed the river throughout last winter. 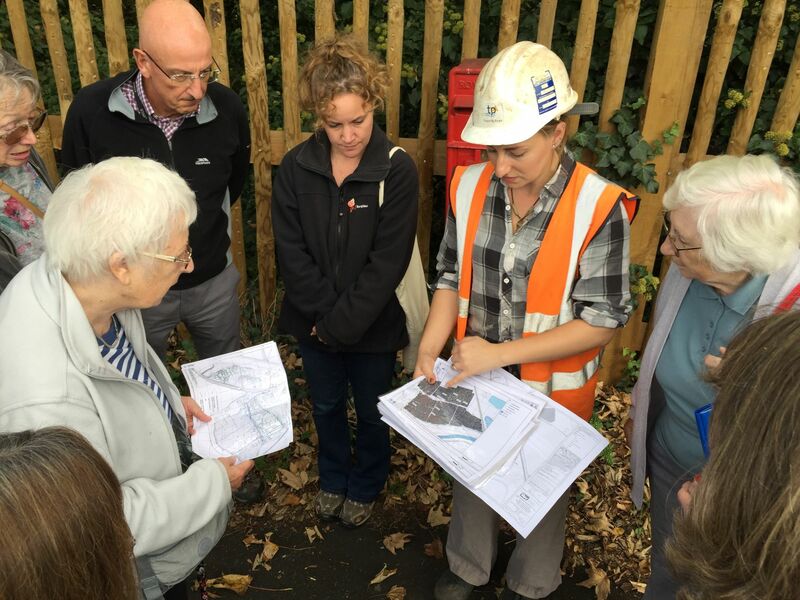 He has also been involved in the design of the RTS to make it wildlife-friendly. 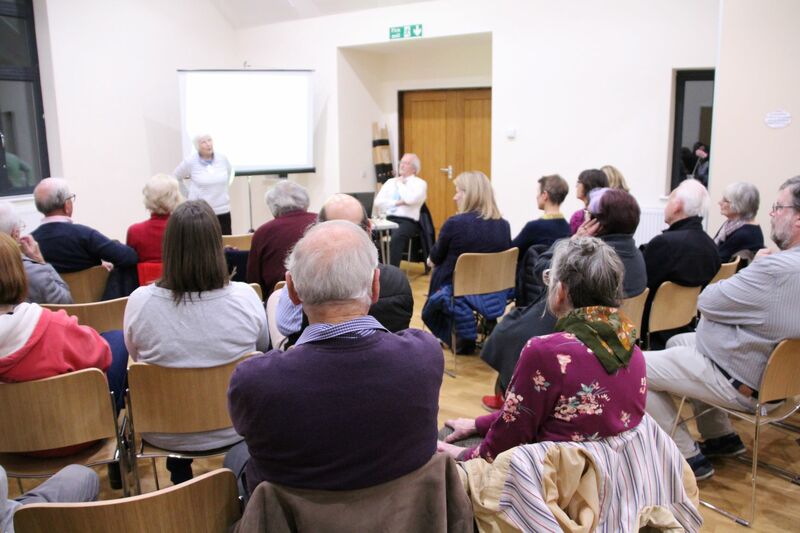 The talk, which was held in St Mary’s Church Rooms, was introduced by Janet Kennish and followed by drinks and nibbles. 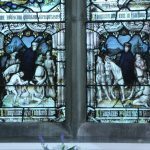 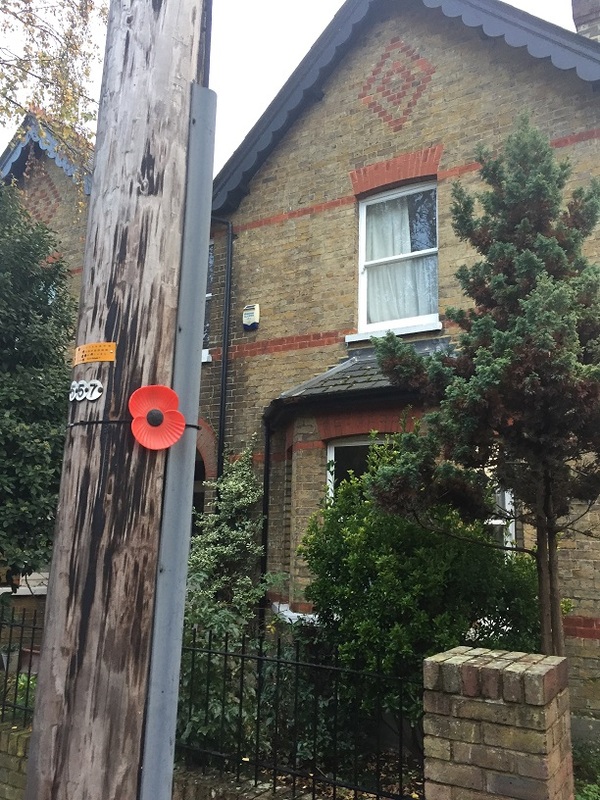 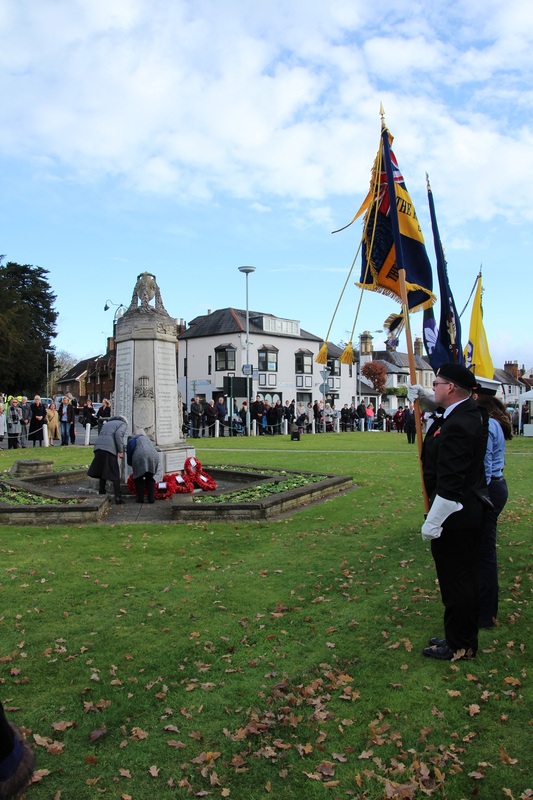 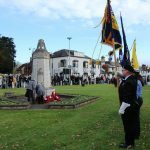 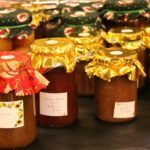 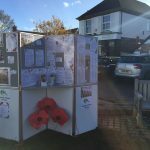 During the WWI centenary commemorations in November 2018, DVS shared its research with the village. 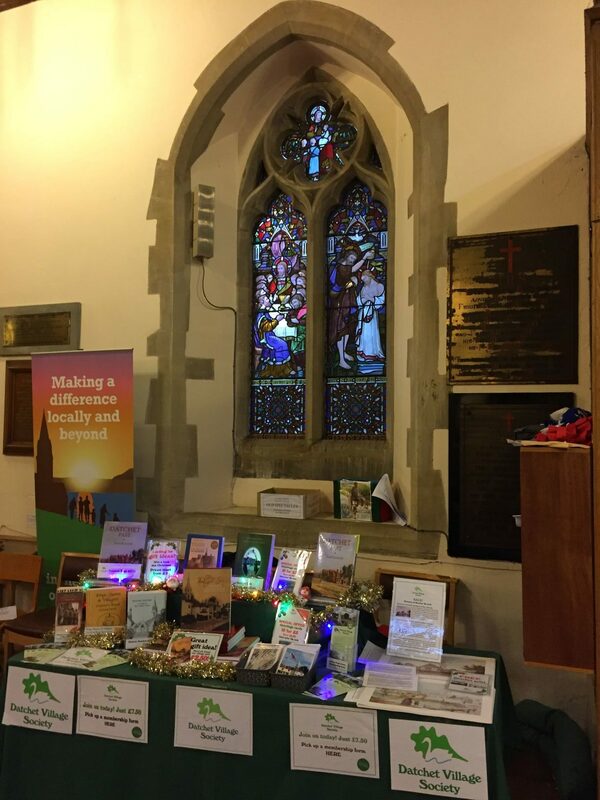 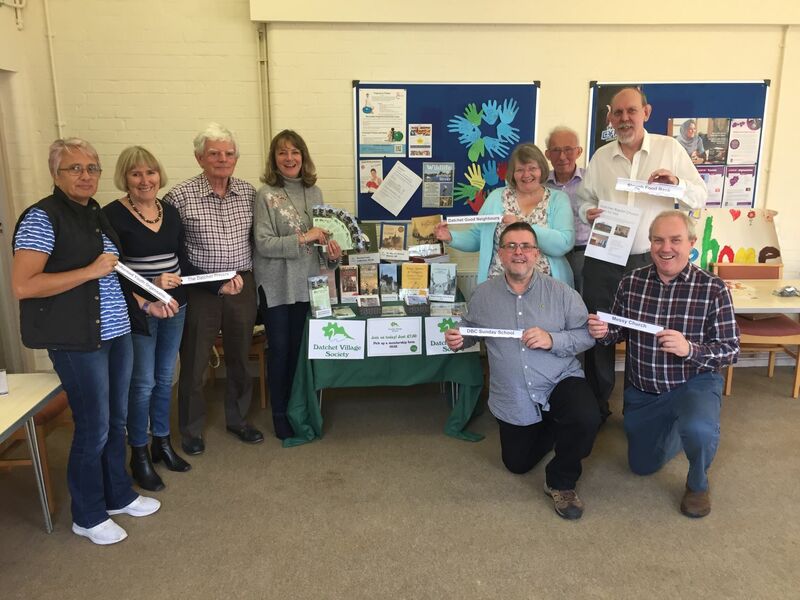 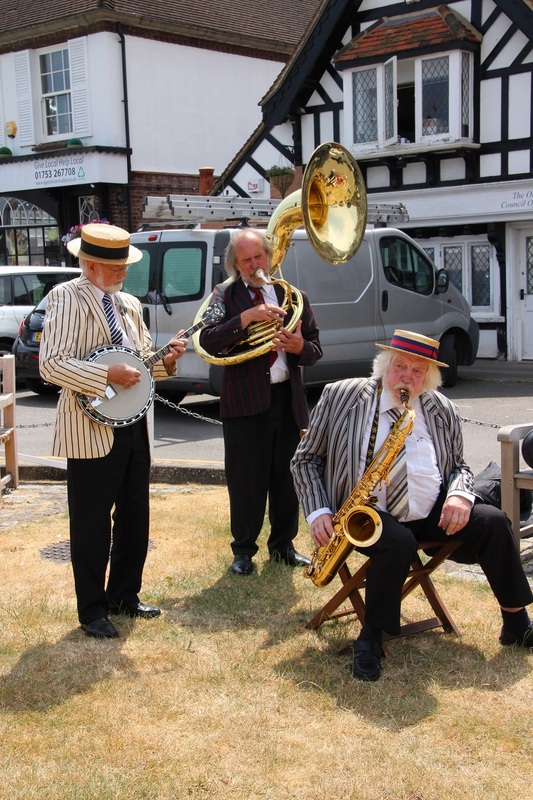 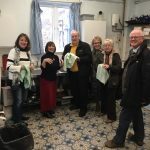 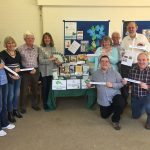 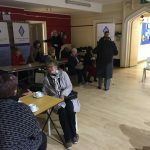 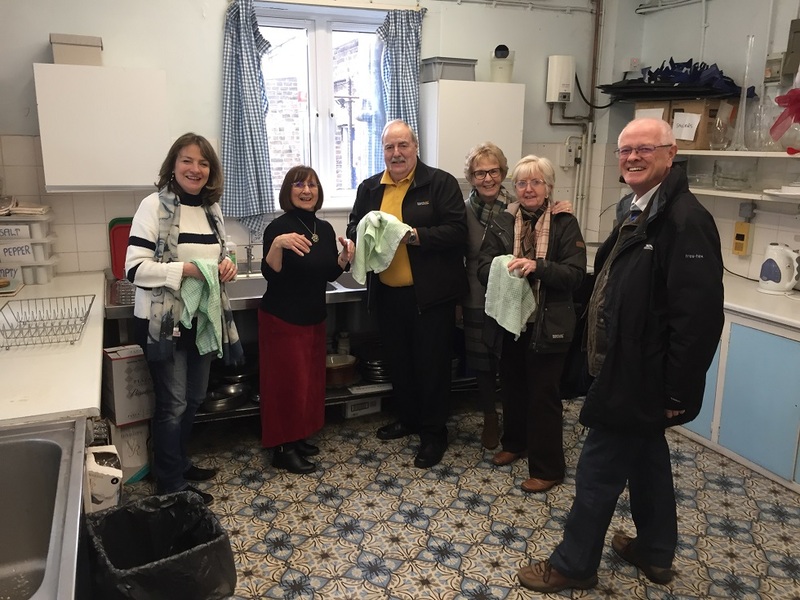 DVS was invited to be part of the Baptist Church’s ‘New to Datchet’ event on 13 October, an occasion designed to introduce new residents to local organisations and help them feel part of the community. 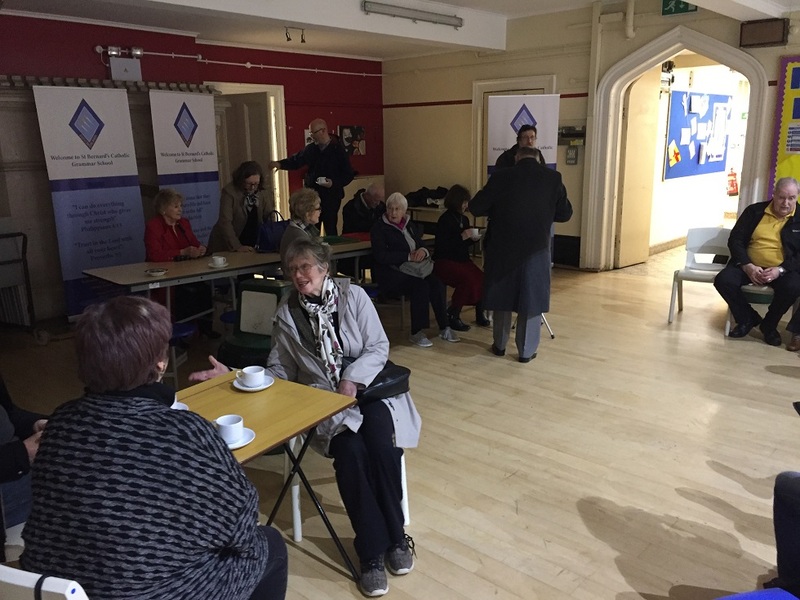 As always, DVS is very happy to support village events and welcome new members to the Society – and the offer of cake is always irresistible! 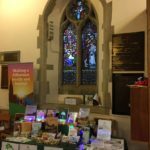 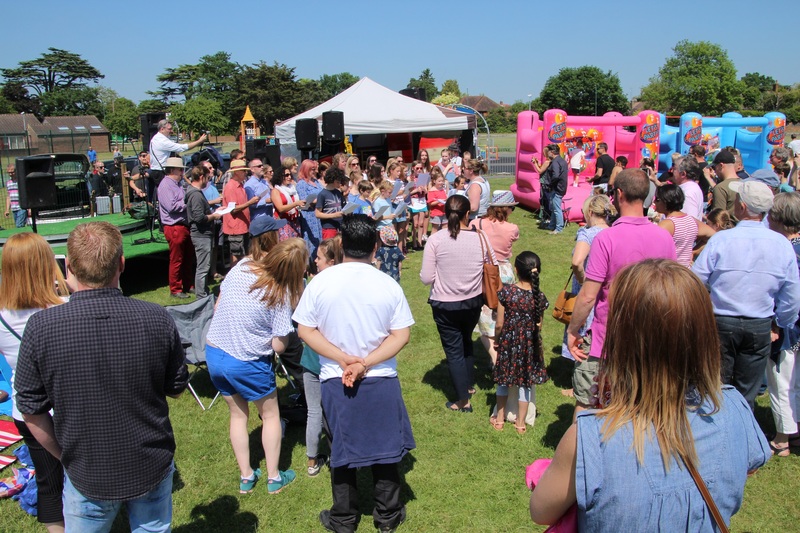 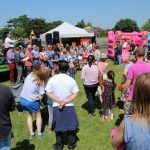 Many thanks to the Baptist Church for organising what we hope will become an annual event. 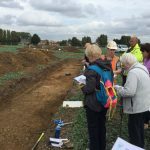 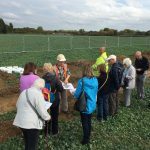 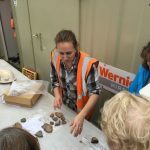 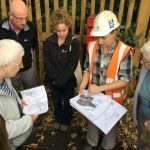 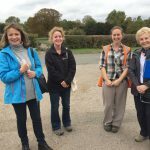 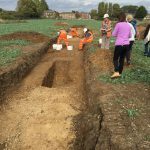 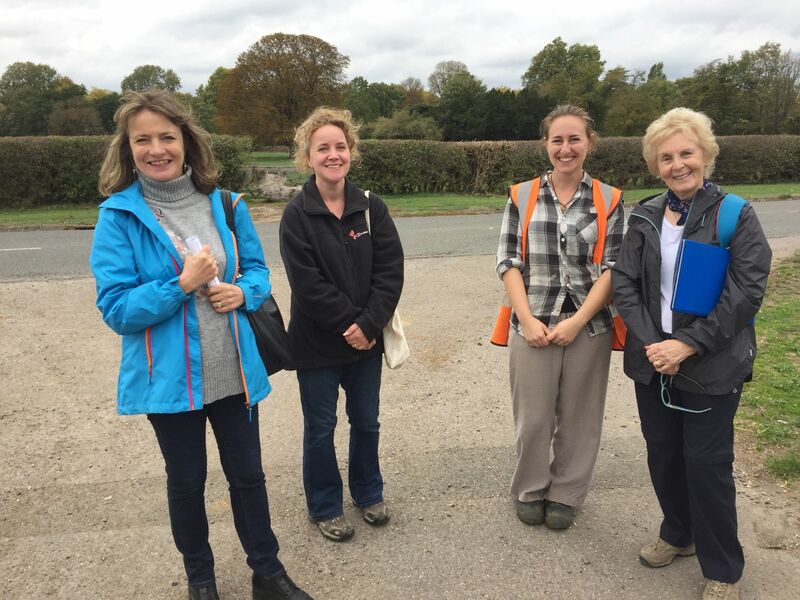 Trent and Peak Archaeology invited DVS along to Southlea Farm on Thursday 11 October 2018 to tell us more about their recent archaeological investigations. 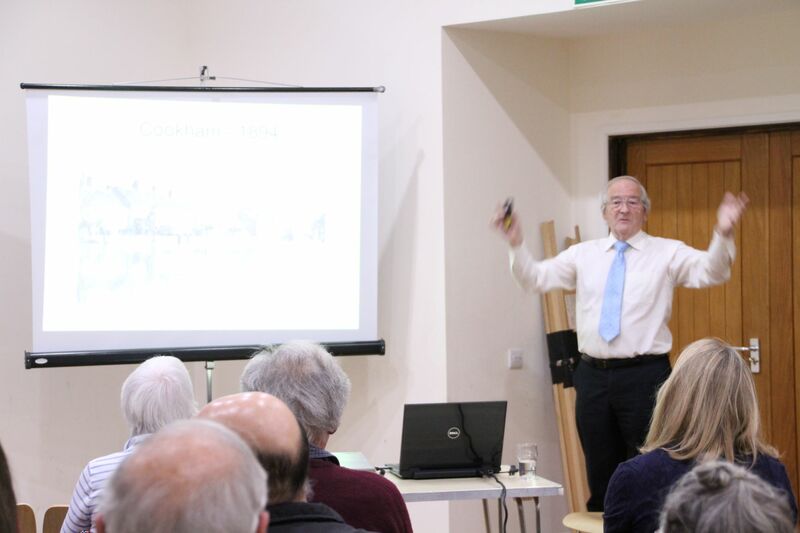 The event was arranged rather hurriedly as we had very short notice, and only a few DVS members were able to attend. 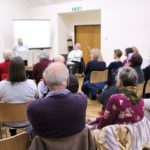 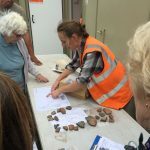 If you missed it, the good news is that Trent and Peak Archaeology plans to hold an event next year in collaboration with DVS so everyone has an opportunity to see what has been going on and what has been found. 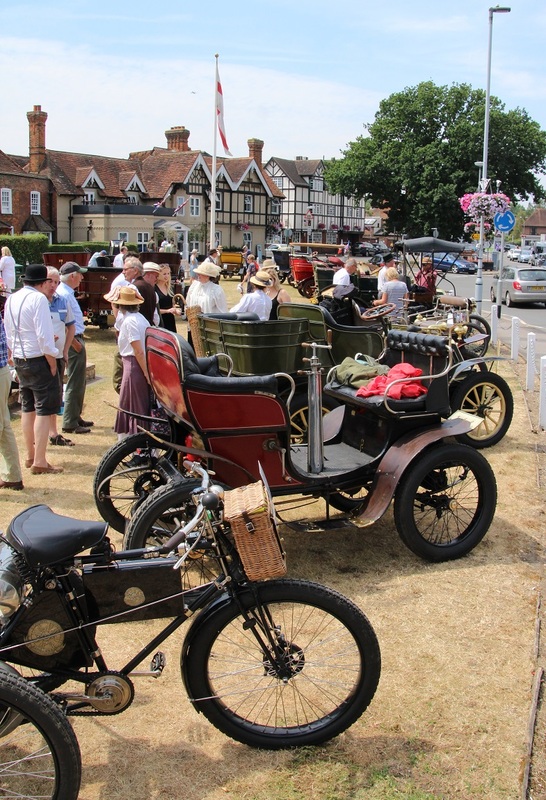 Details to follow as soon as a date has been confirmed. 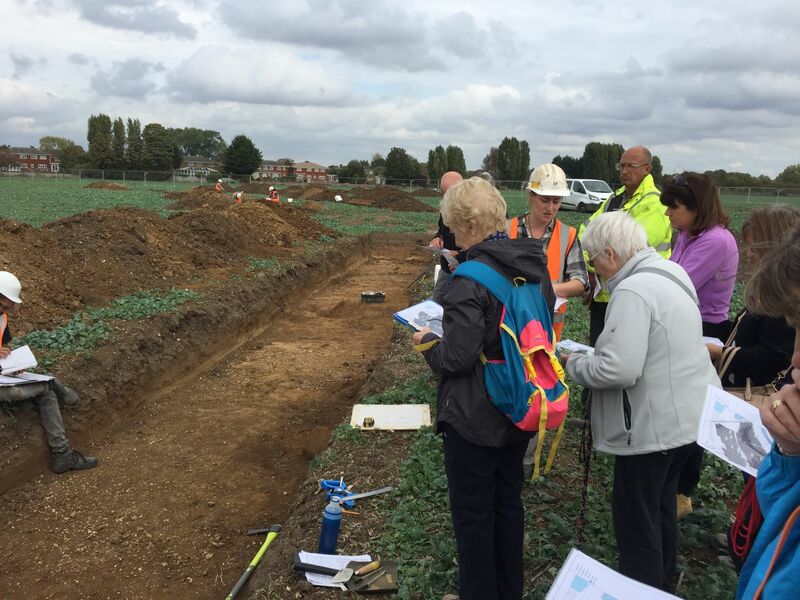 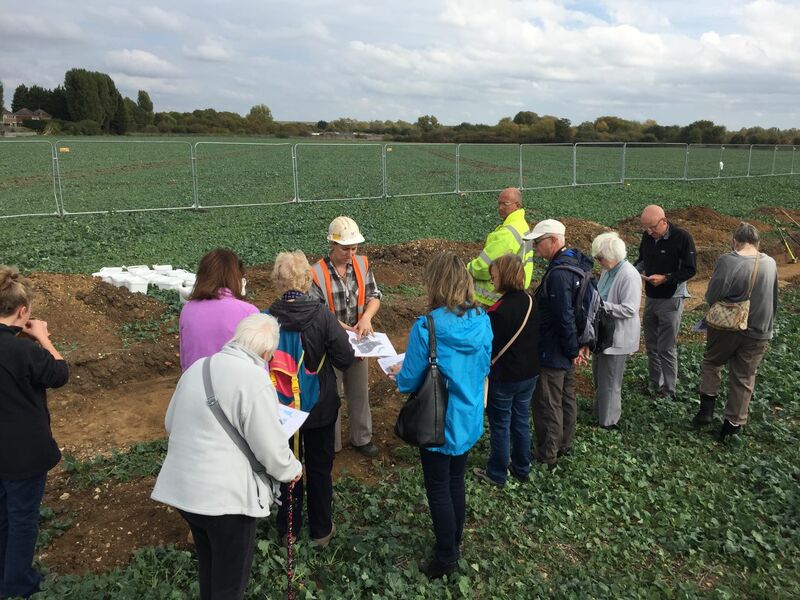 We were shown where numerous trenches had been dug along the route of the proposed new River Thames Scheme. 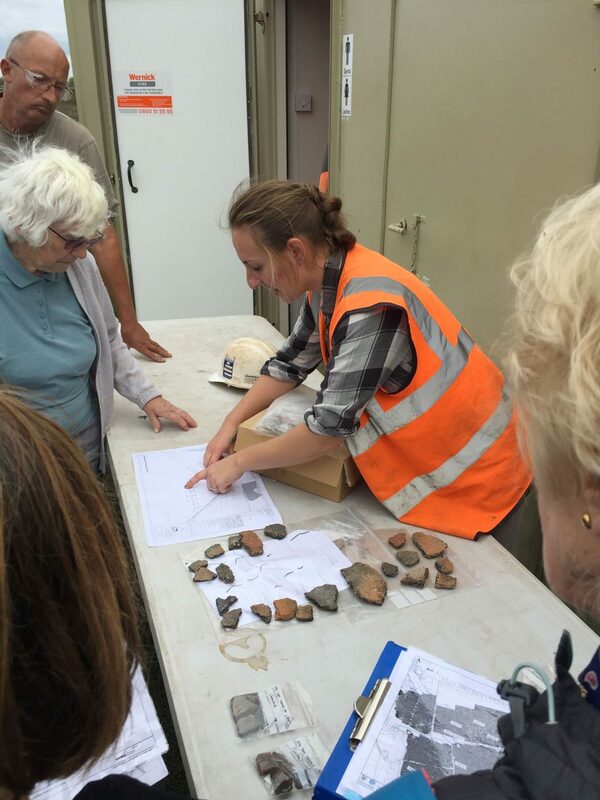 …and we learned more about the meticulous process of recording finds. 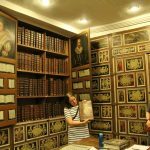 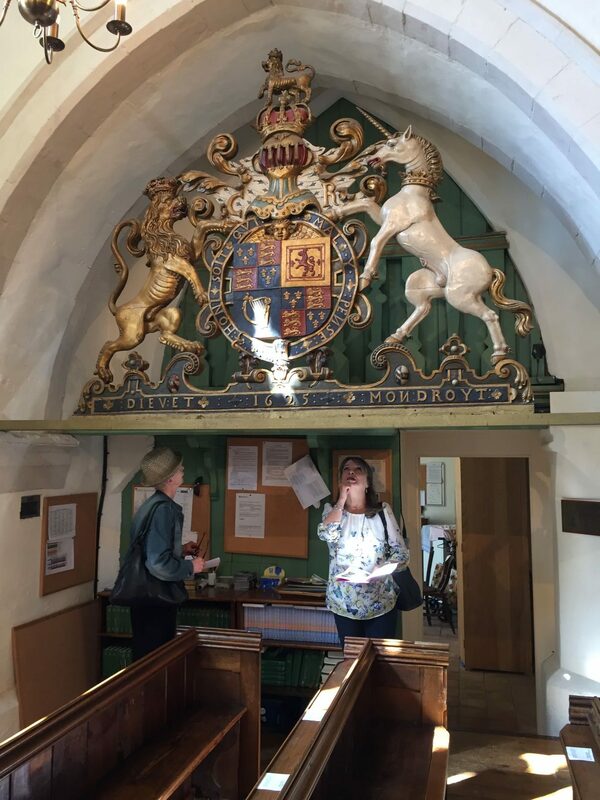 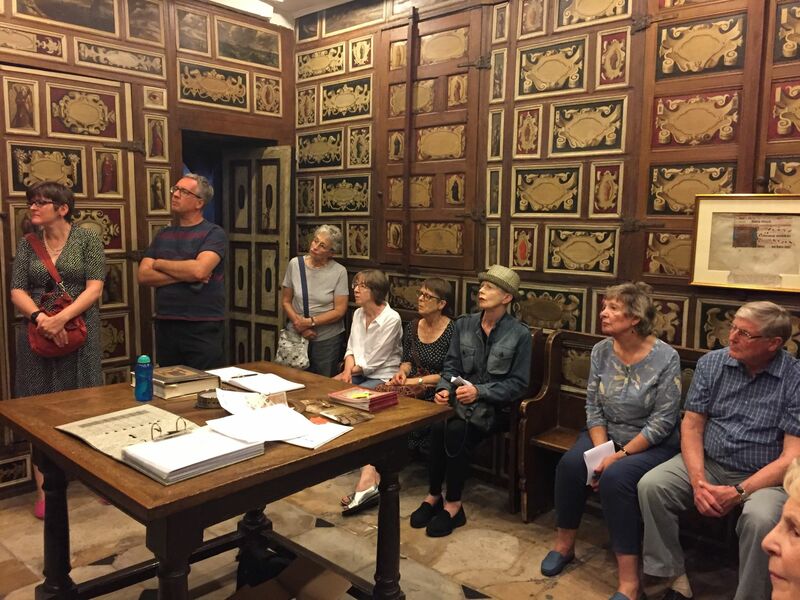 On 2 September, the DVS visited Sir John Kedermister’s Library at St Mary’s Church in Langley. 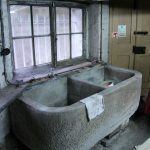 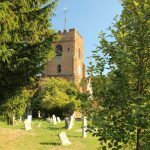 Anyone who has visited before would know the surprise of finding such a little-known gem almost on our doorstep. 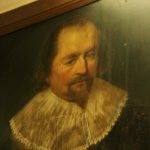 Sir John Kedermister had owned land in Langley from the 1500s (sometimes in dispute with Robert Barker of Datchet!) 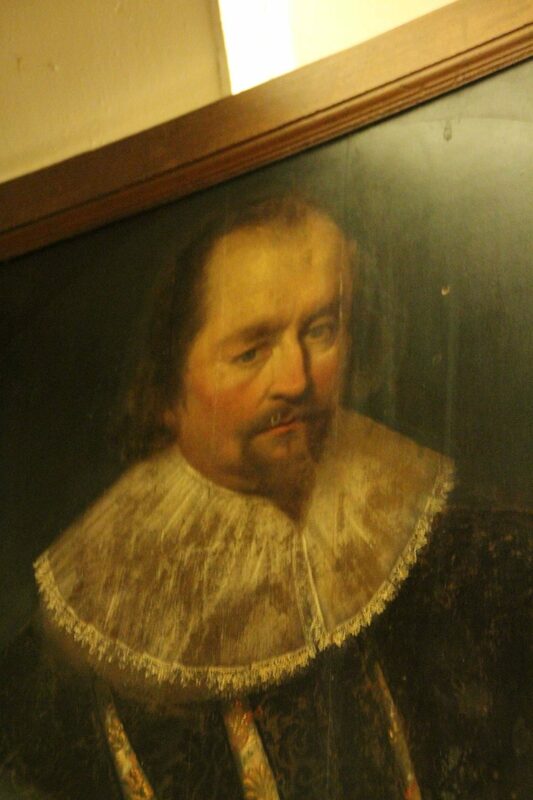 and in 1626 became the Lord of Langley Manor. 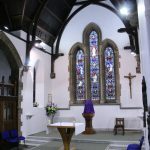 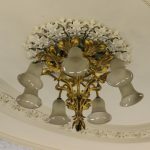 He was a benefactor for the church providing many splendid furnishings which still survive, including the Kedermister Chapel. 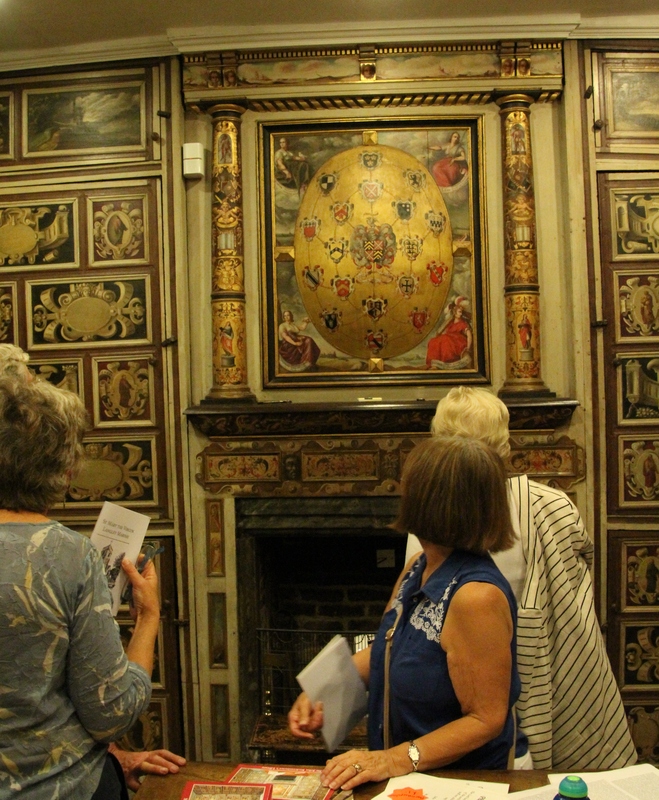 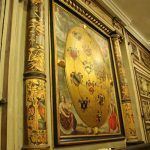 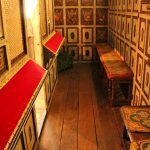 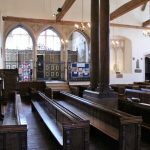 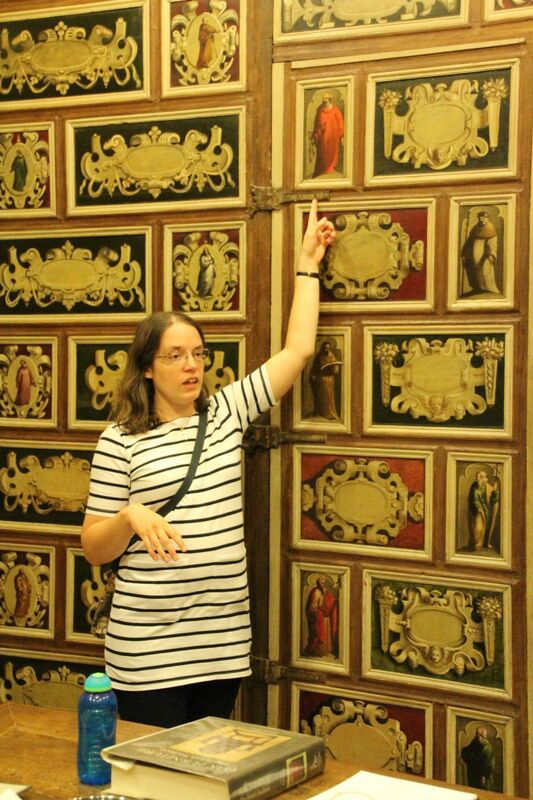 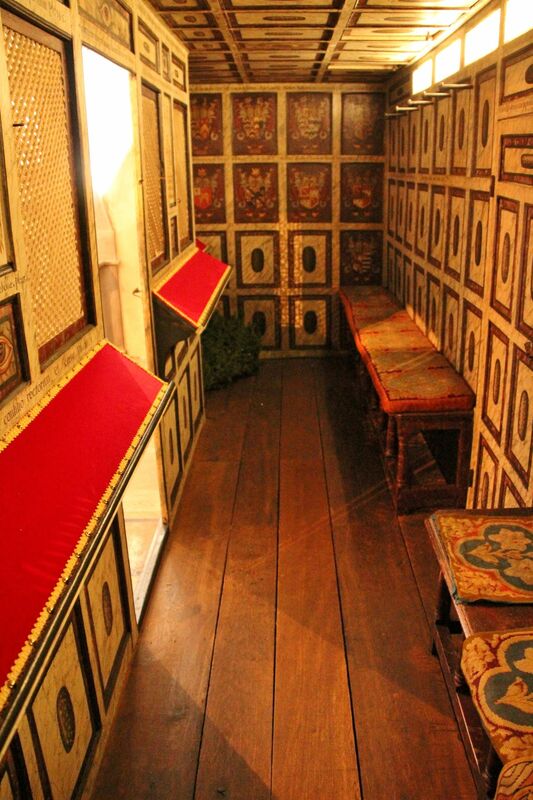 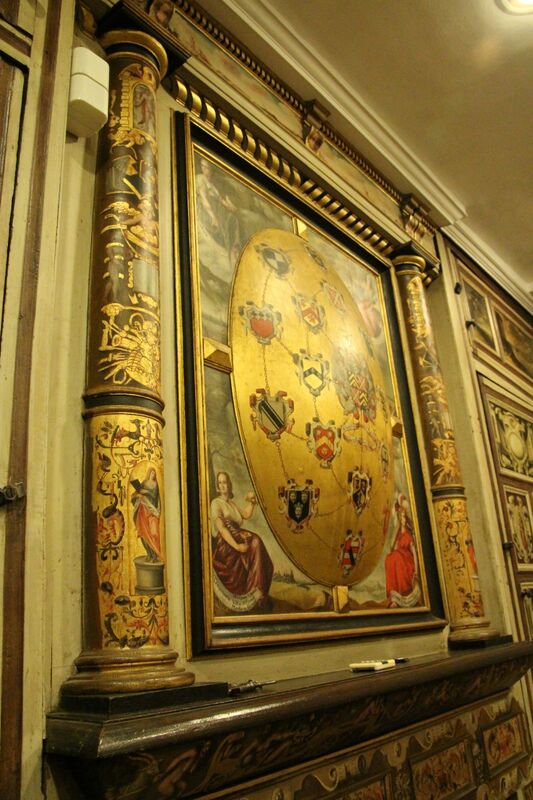 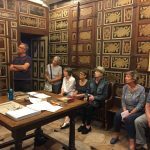 The Chapel houses a private pew for his family’s use and the Library, both built in the 1630s and painted with trompe l’oeil detail over every surface. 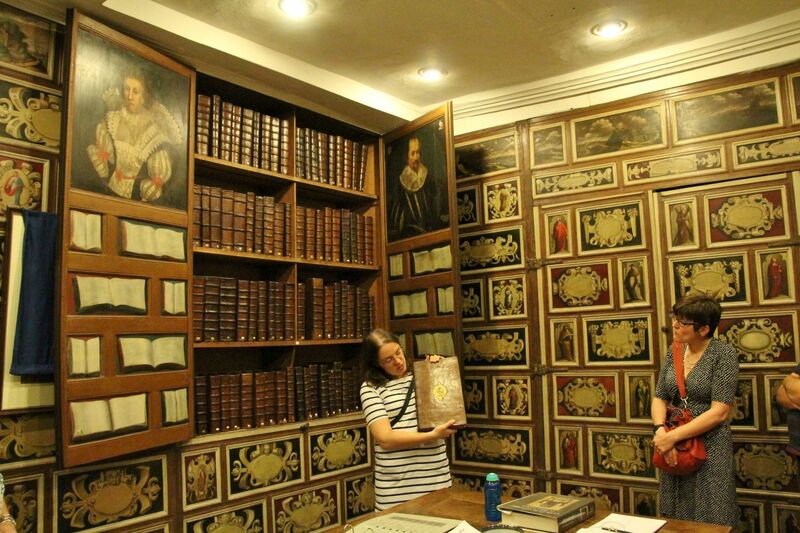 The Library was founded so that local clergy could access theological volumes. 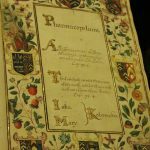 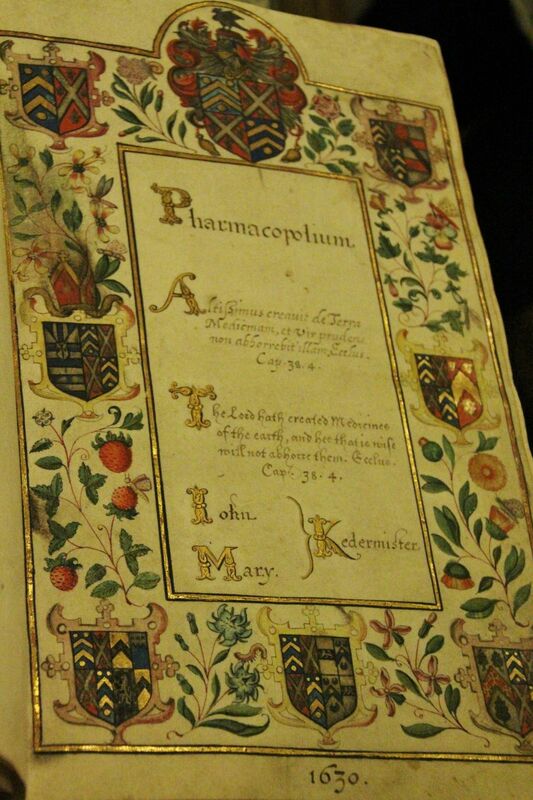 Also interesting to modern eyes is the Kedermister family’s Pharmacopolium, a handwritten book listing homemade remedies for various ailments. 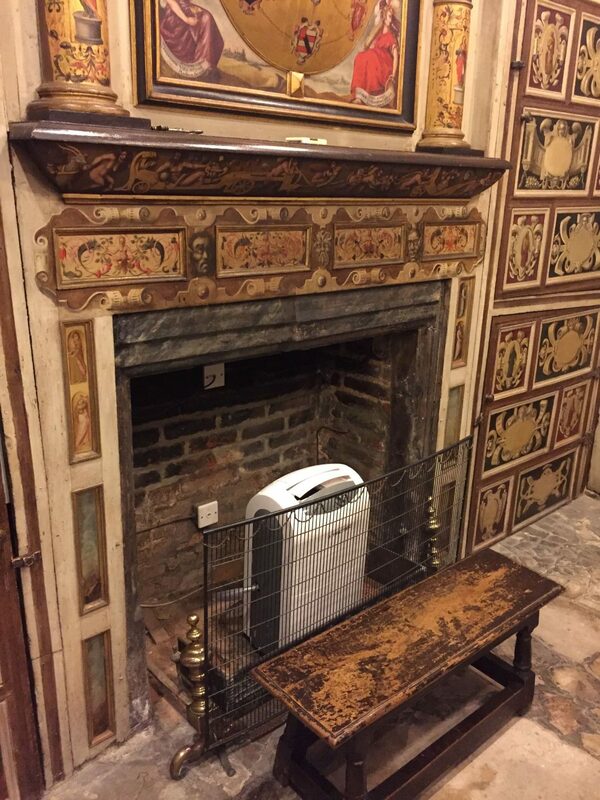 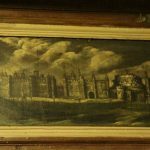 In 1825, a later Lord of the Manor, Robert Harvey, employed William Bidwell of Datchet to ‘repair and make good the gold mouldings by the side of the fire place, repaint the landscapes in pannels of ditto and paint ornaments in each of the plain pannels to match’. 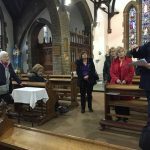 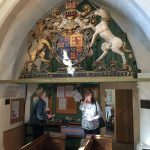 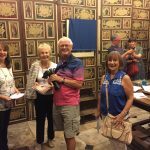 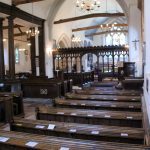 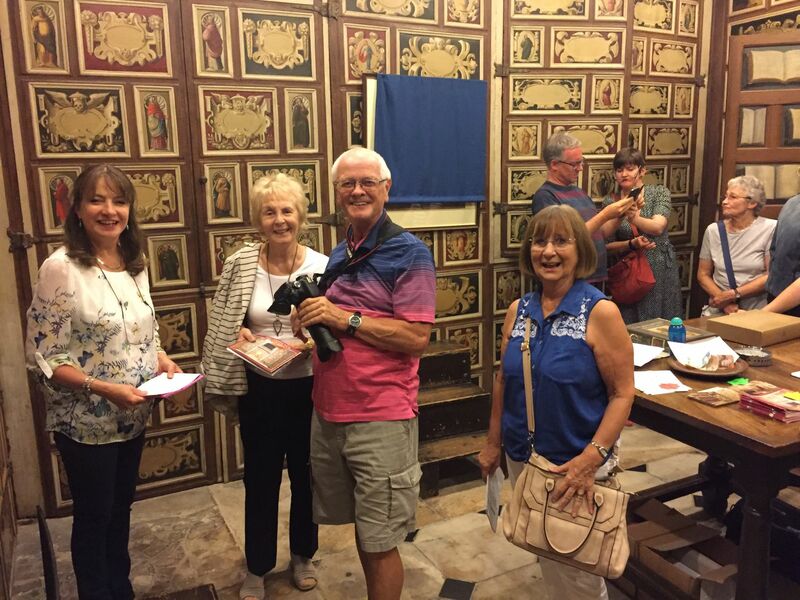 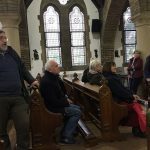 The group then toured the church which dates from the 12th century and is listed in England’s Thousand Best Churches by Simon Jenkins. 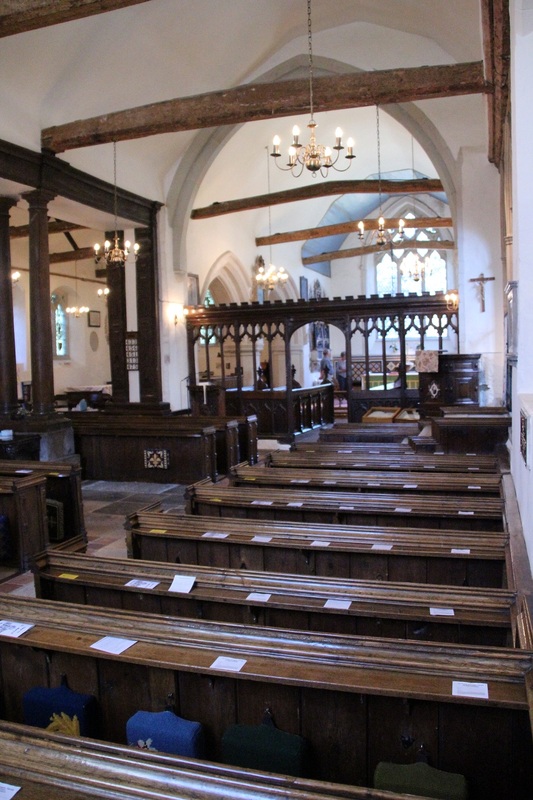 In 1825, William Bidwell of Datchet was employed to repair and paint the pew and library. 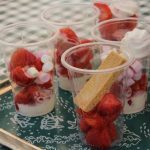 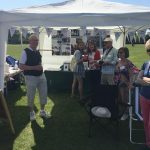 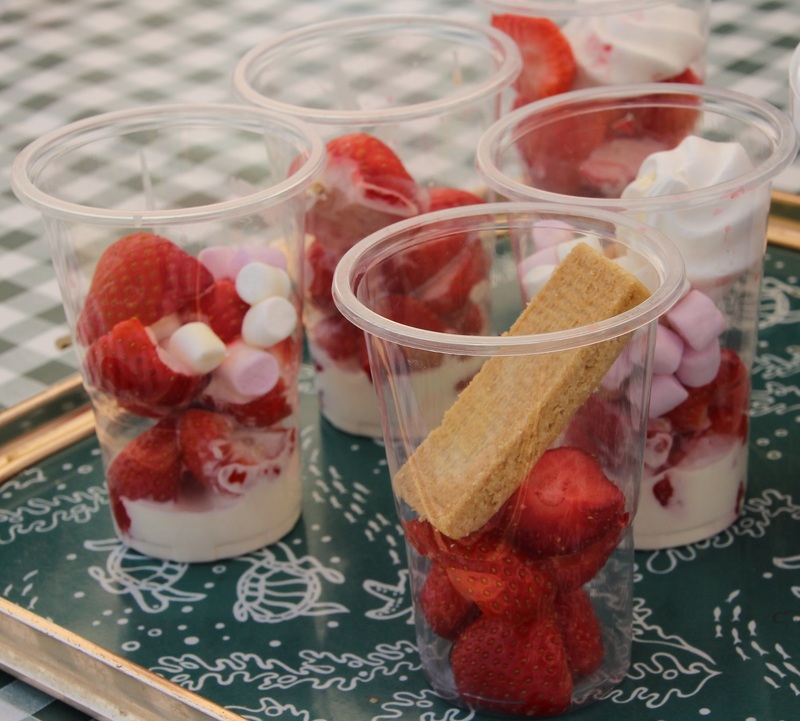 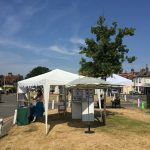 On the first Saturday in July, the DVS stall was in action again, supporting the village fete. We used the opportunity to show off the lovely new (old) paintings of Datchet that were purchased recently on ebay. 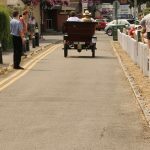 Many people suggested that it might be a good idea to reinstate the turnpike at the bottom of London Road! 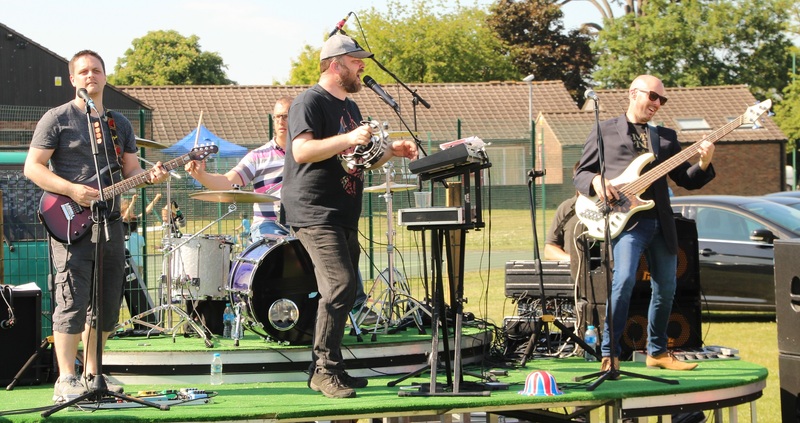 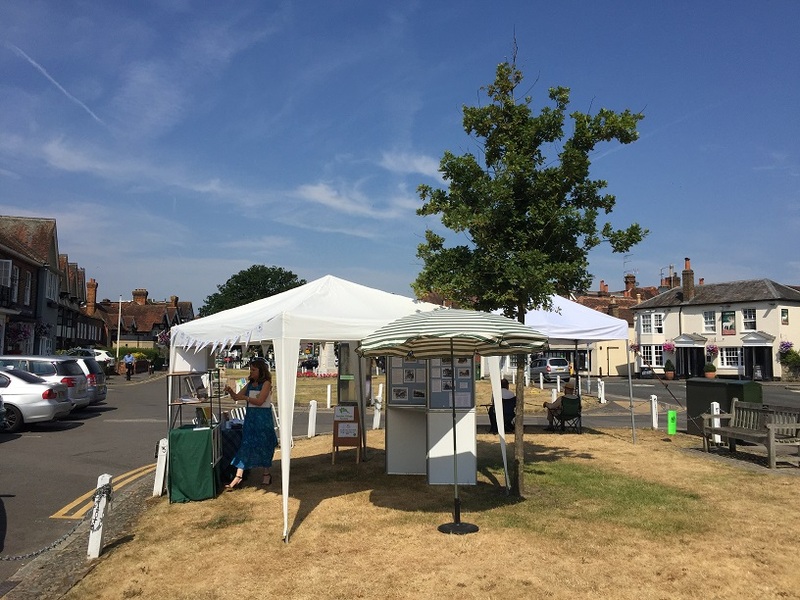 The extreme heat and a clash with an England football match and the Wimbledon Ladies’ final, meant that most stalls closed early, but thank you to everyone who came along to see us. 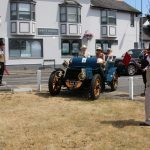 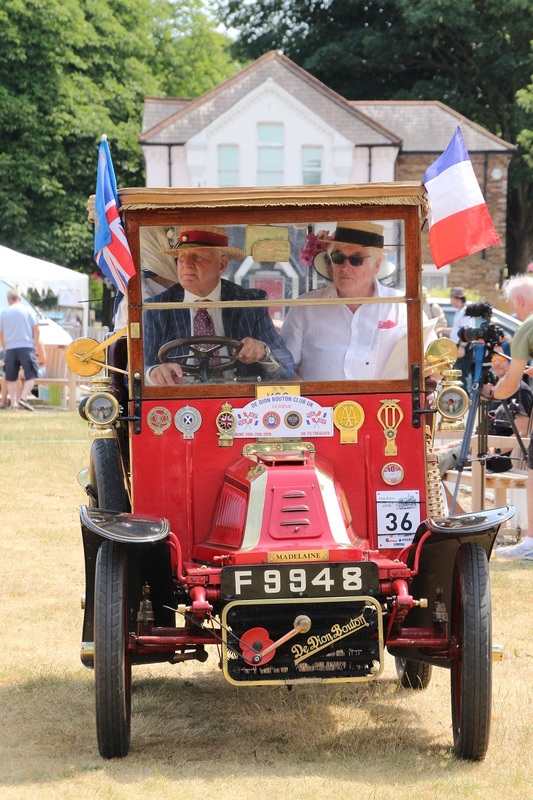 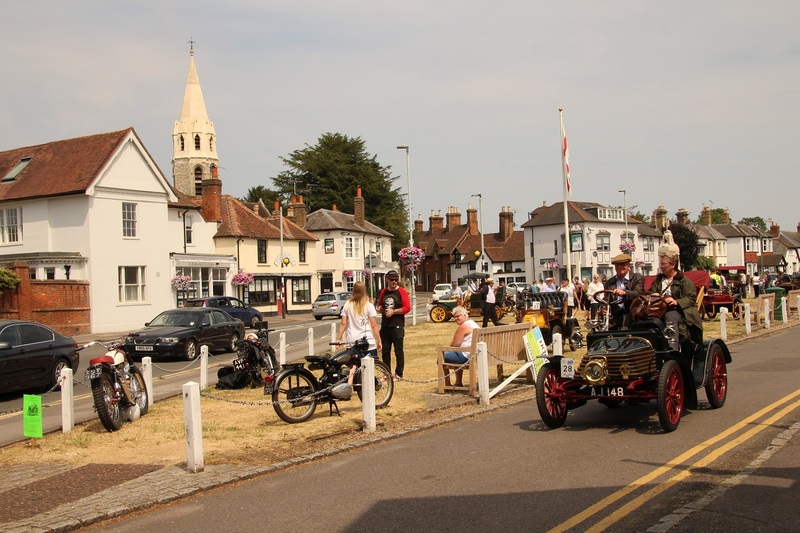 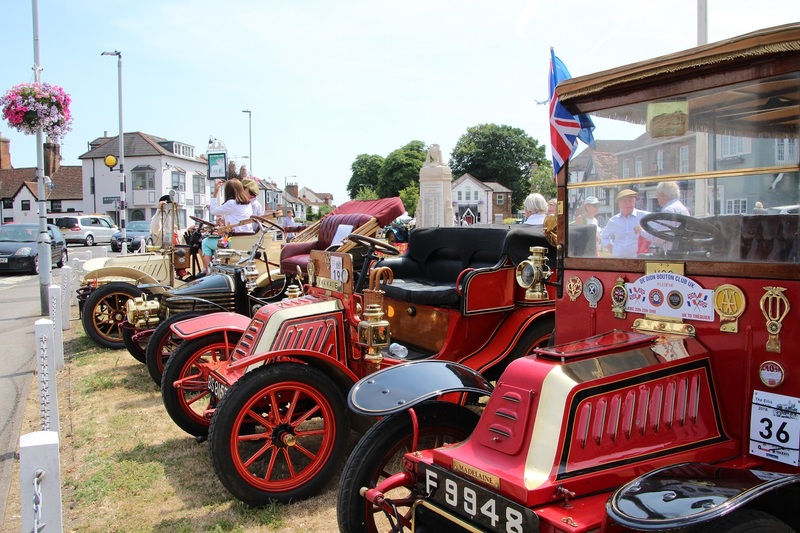 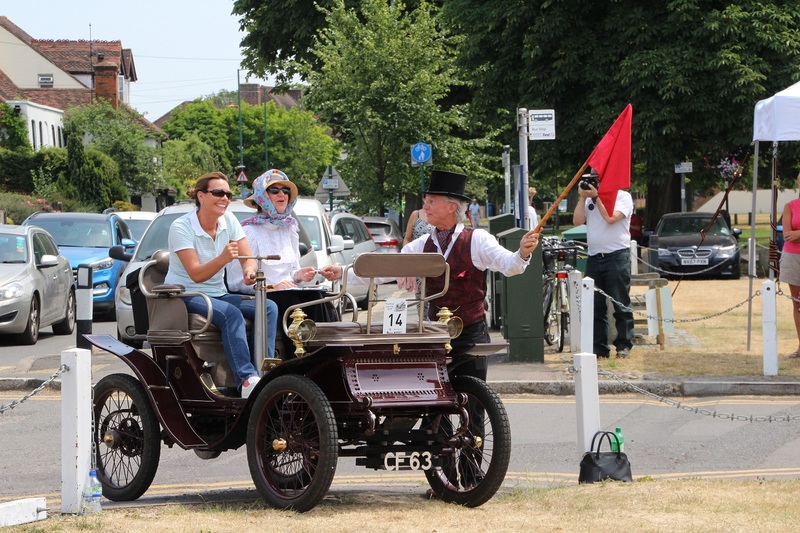 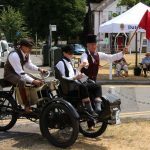 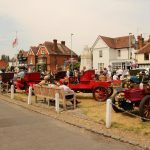 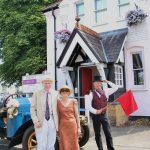 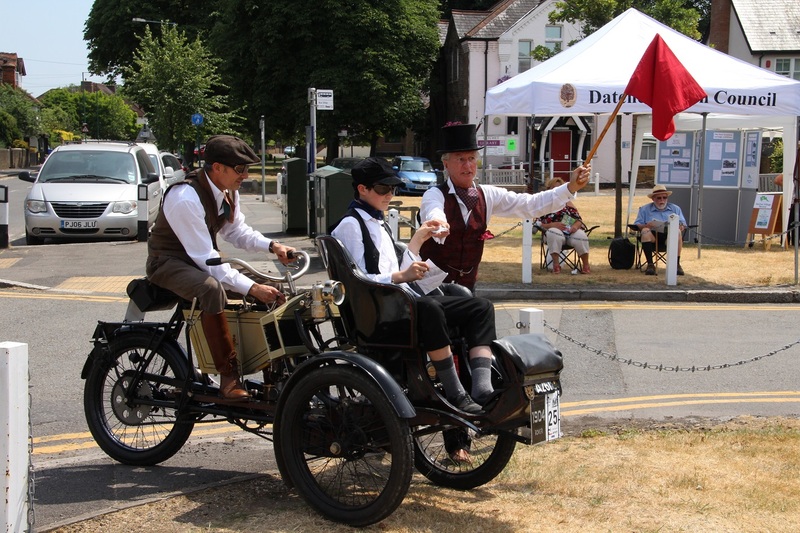 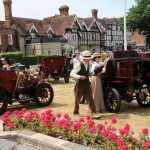 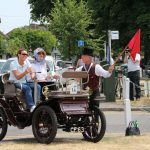 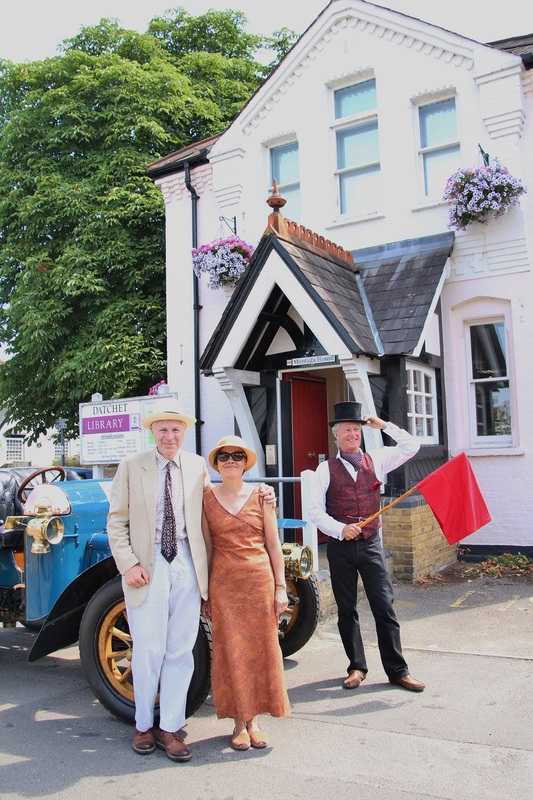 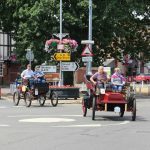 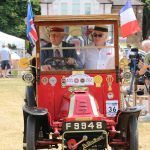 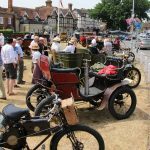 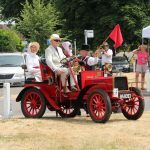 On the first Sunday in July, there was a second re-enactment of the journey made on 5 July 1895 by pioneering automobilist, Evelyn Ellis, from Micheldever Station in Hampshire to his home at Rosenau, on Southlea Road, Datchet. 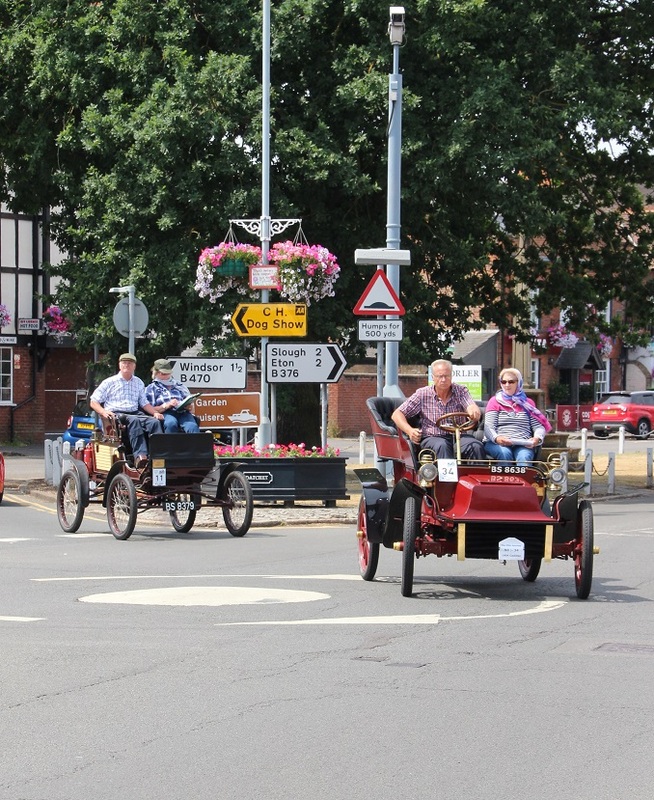 That original journey was the first ever recorded by a motorised carriage in the UK. 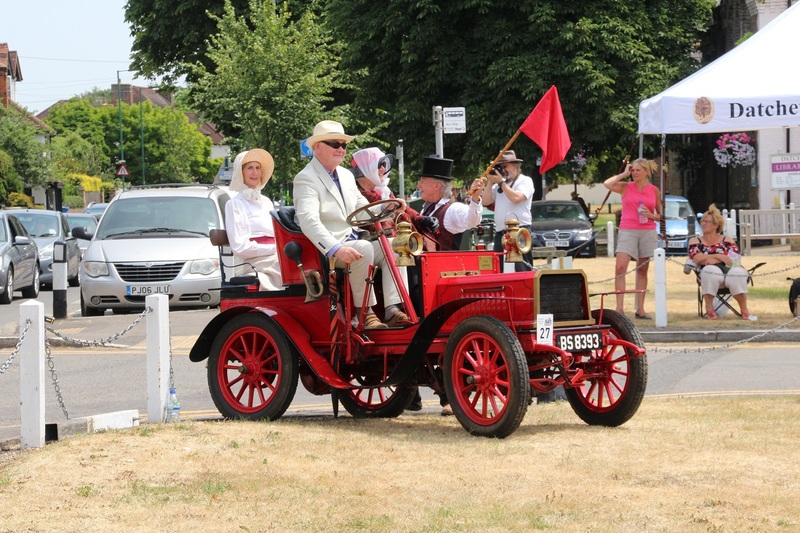 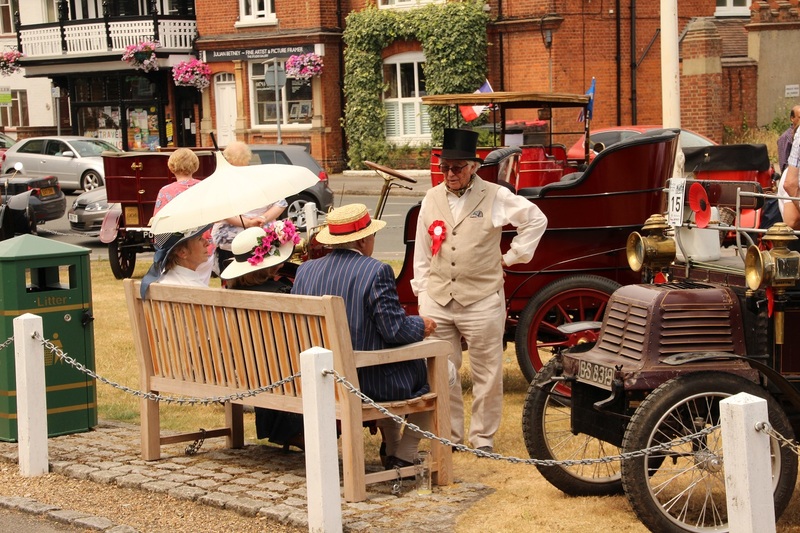 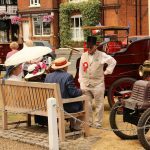 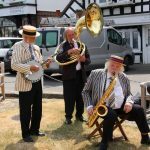 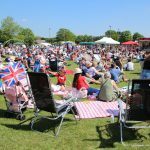 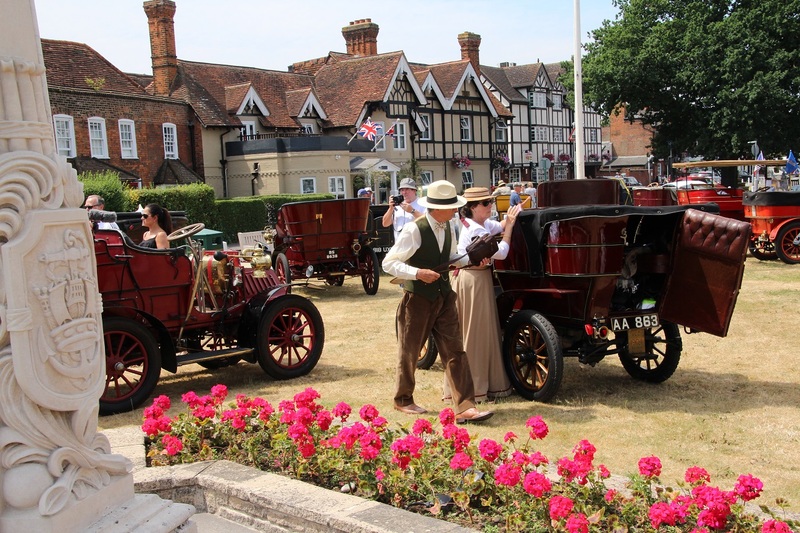 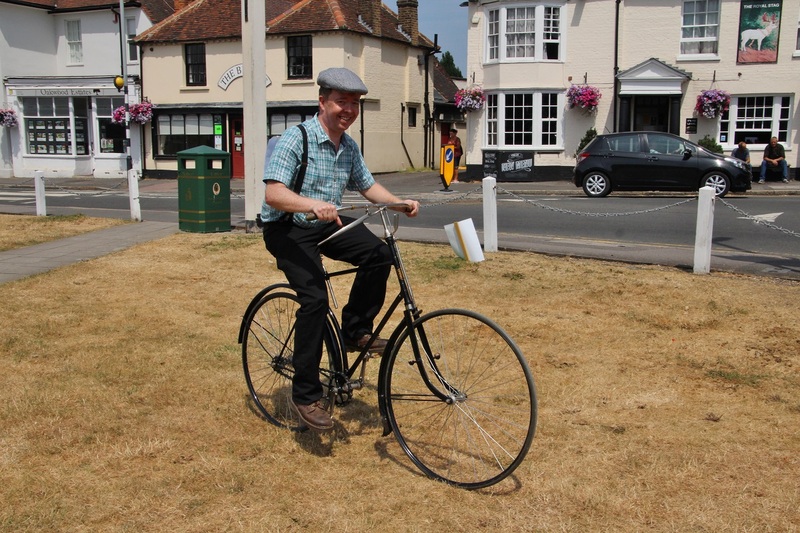 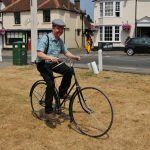 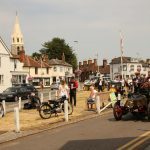 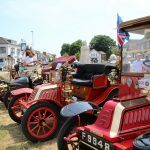 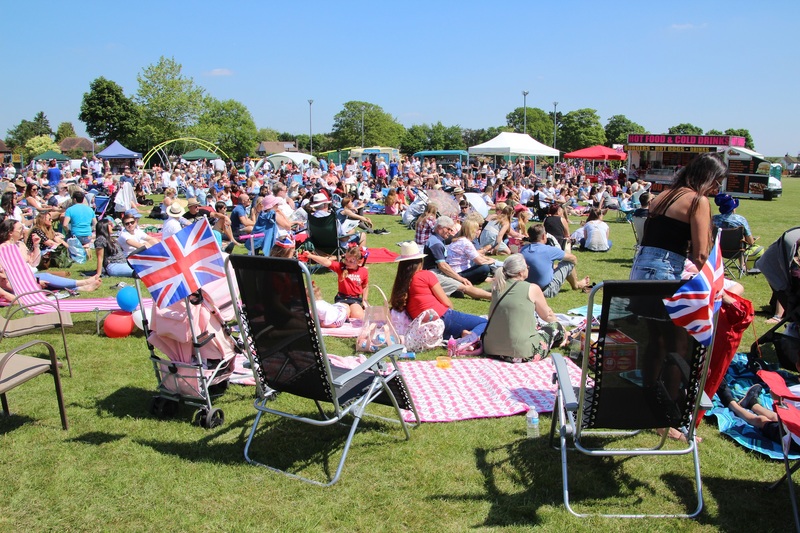 This year’s event culminated with a display of around 30 pre-1905 cars, motorcycles, tricycles and cycles on our village greens. 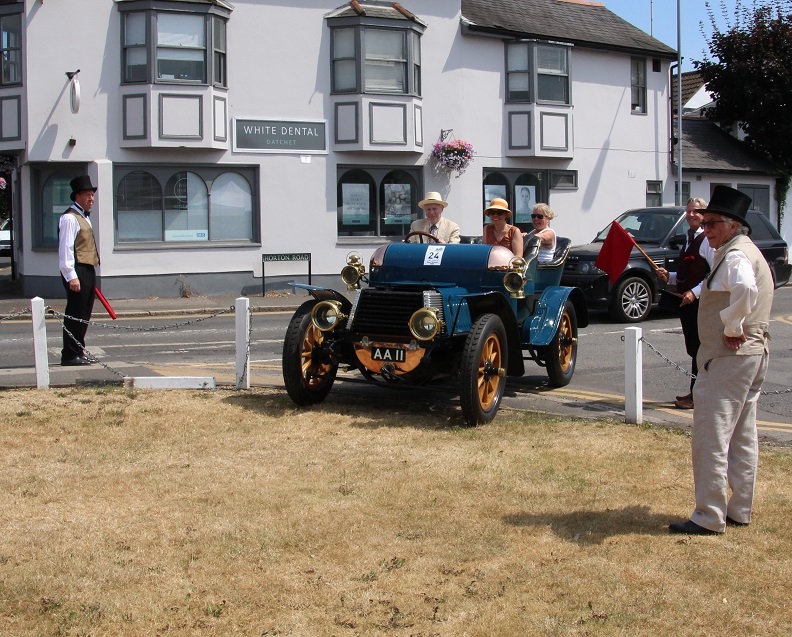 Many of the entrants wore period costumes and the best-dressed received a copy of Janet Kennish’s Datchet Past. 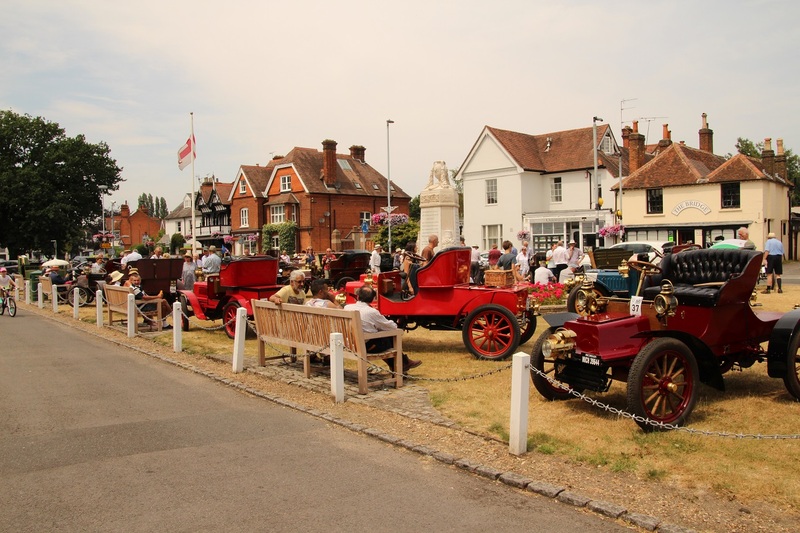 The DVS had a stand on Gossip Green, in front of the library, with a display about Evelyn Ellis and Datchet’s motoring history. 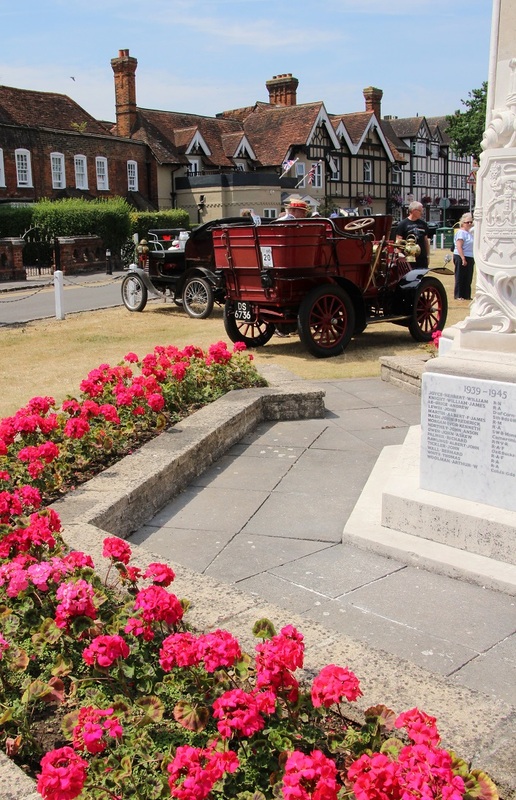 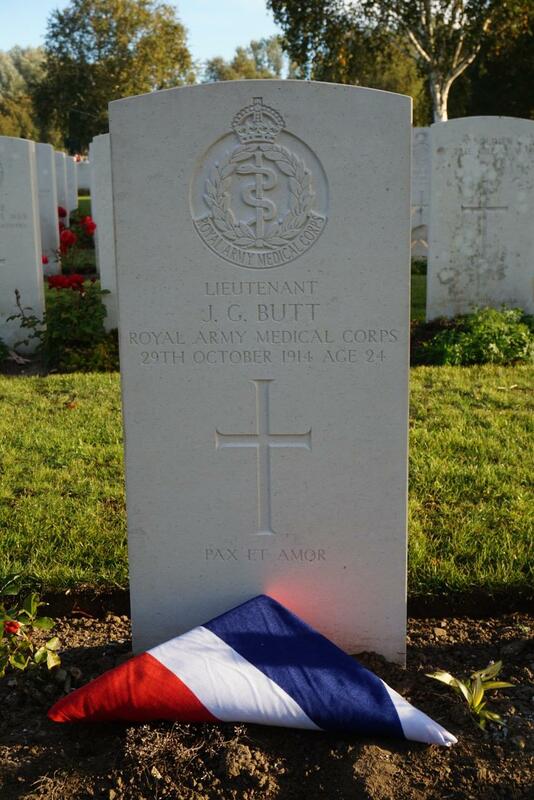 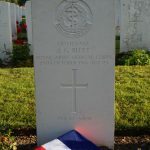 Please visit Janet’s Datchet History website to read more about Evelyn Ellis. 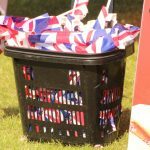 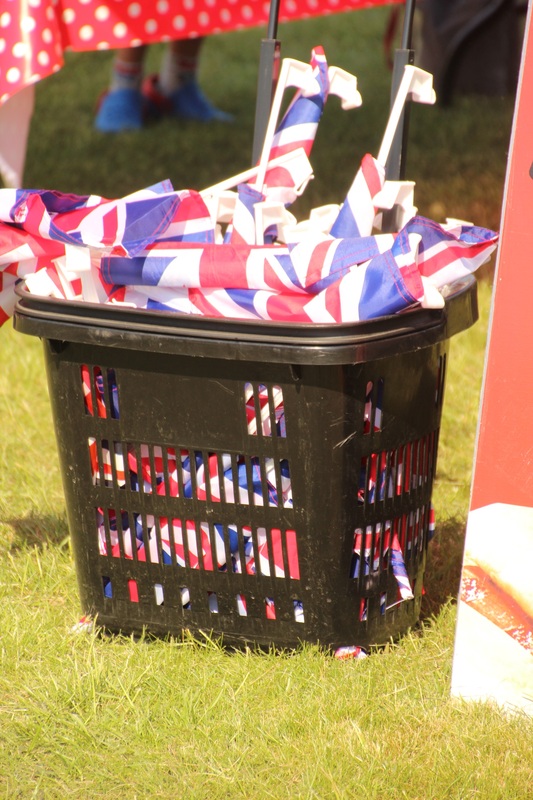 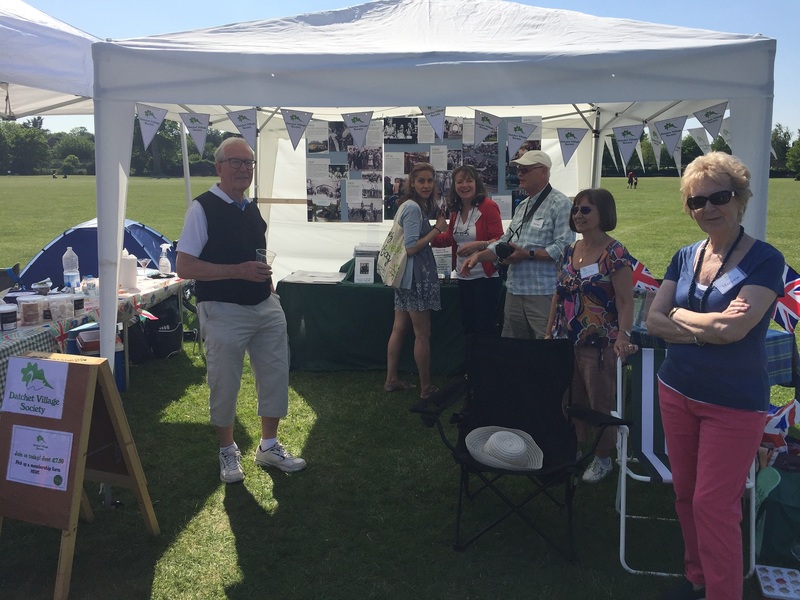 The DVS, always keen to support village events, had a stall at the Royal Wedding Party on the Rec, on 19 May 2018, to celebrate the marriage of Prince Harry and Meghan Markle. 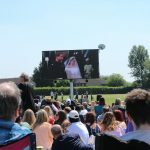 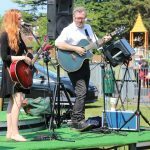 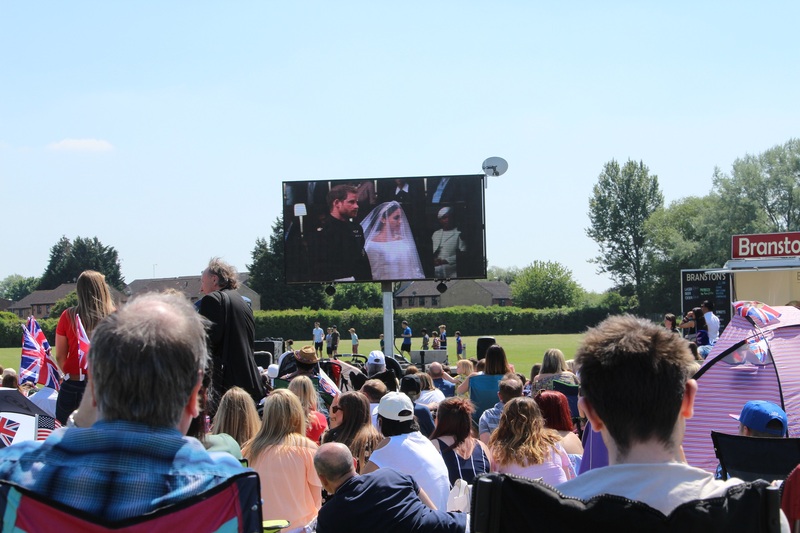 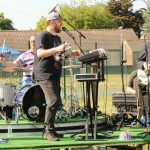 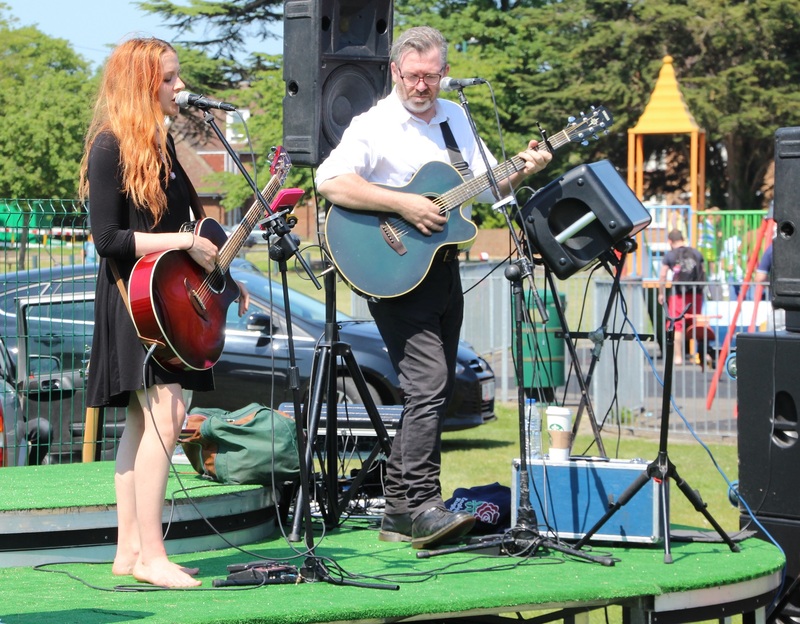 The day kicked off with the screening of the wedding, followed by live music and, later in the afternoon, by the FA Cup Final. 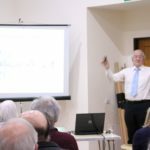 The AGM was held on 25 April 2018 at Datchet St Mary’s Primary Academy. 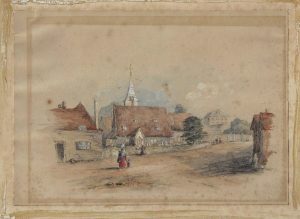 There were a number of paintings of Datchet on display including two ‘new’ ones, lovely watercolours of Datchet, painted around 1850-1860. 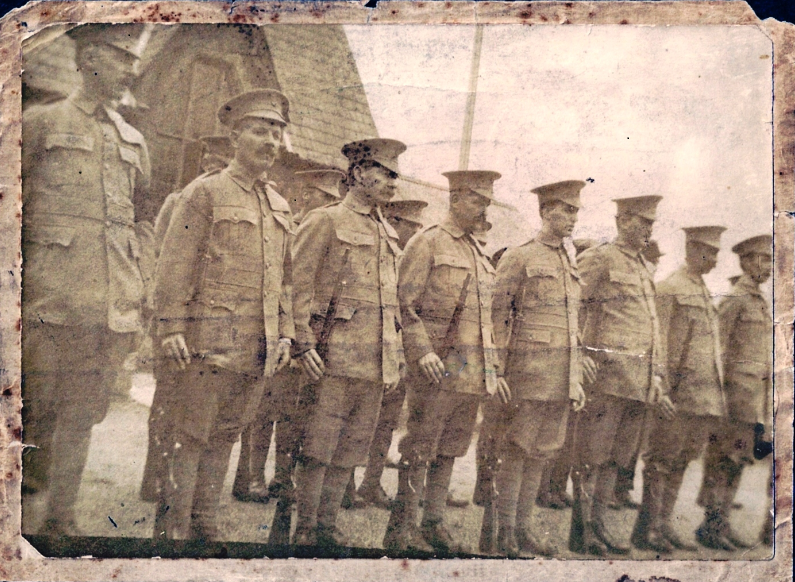 They are not signed or dated but are the earliest pictures of the village yet known. 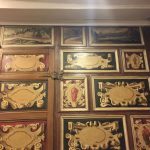 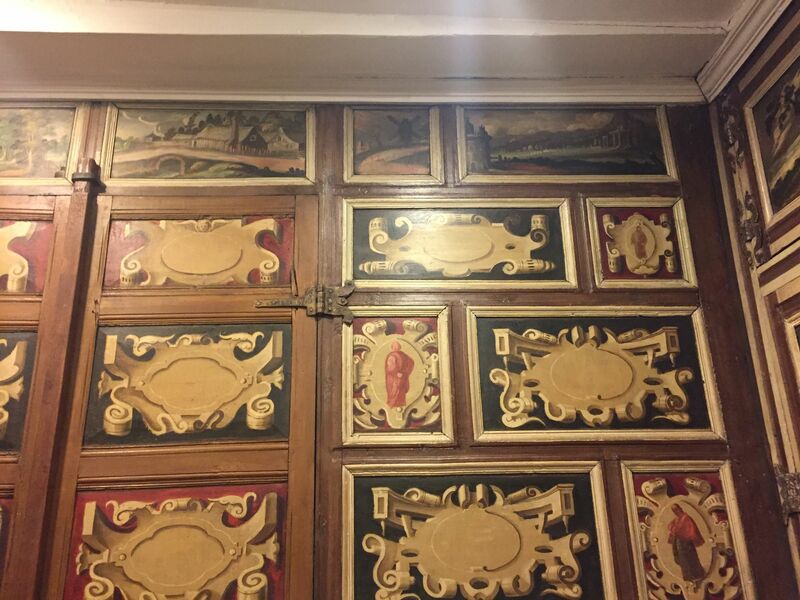 The DVS and Barker Bridge House Trust have purchased these paintings and had them restored and framed. 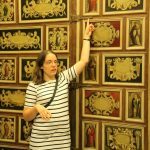 Janet talked about what they all reveal and how we can date them. 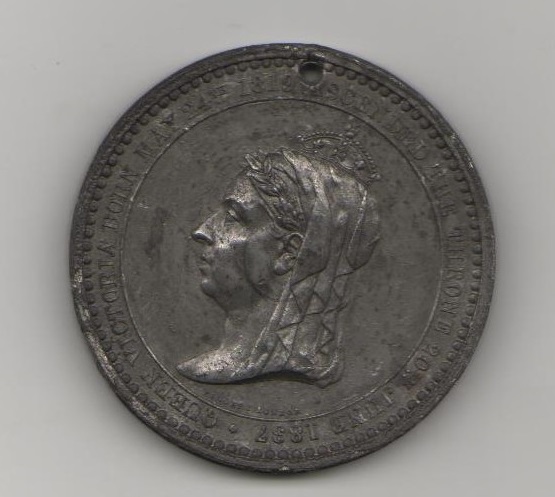 DVS was also able to display a Victorian Jubilee medal purchased recently on eBay. 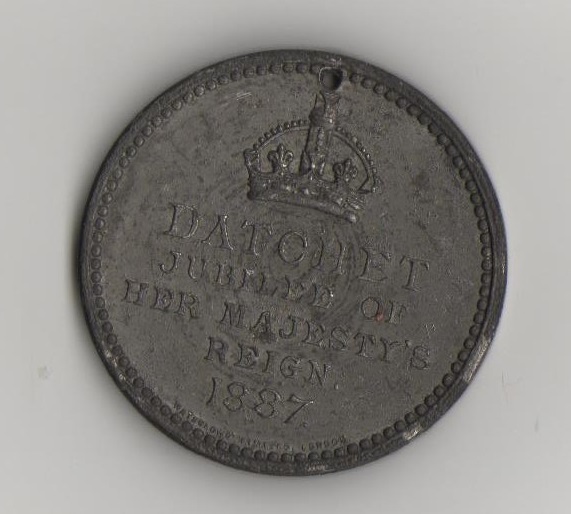 These medals were minted to commemorate Queen Victoria’s Golden Jubilee on Tuesday 21 June 1887. 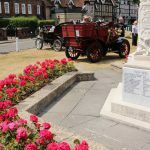 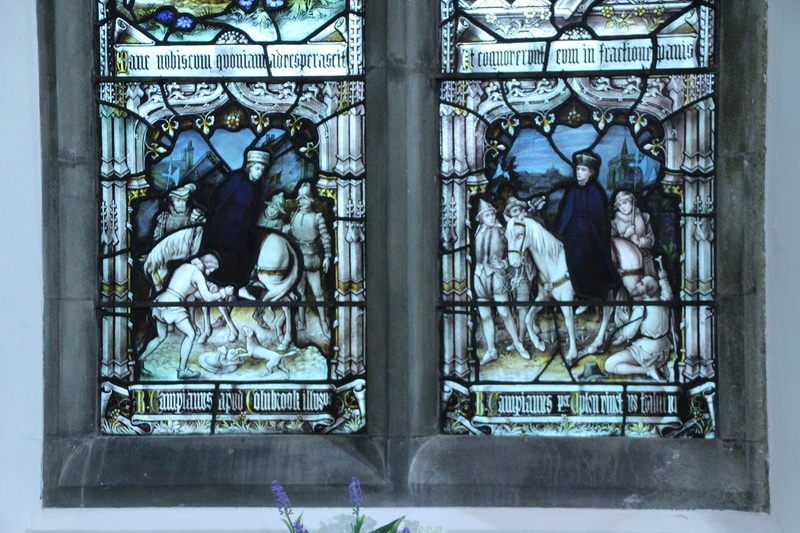 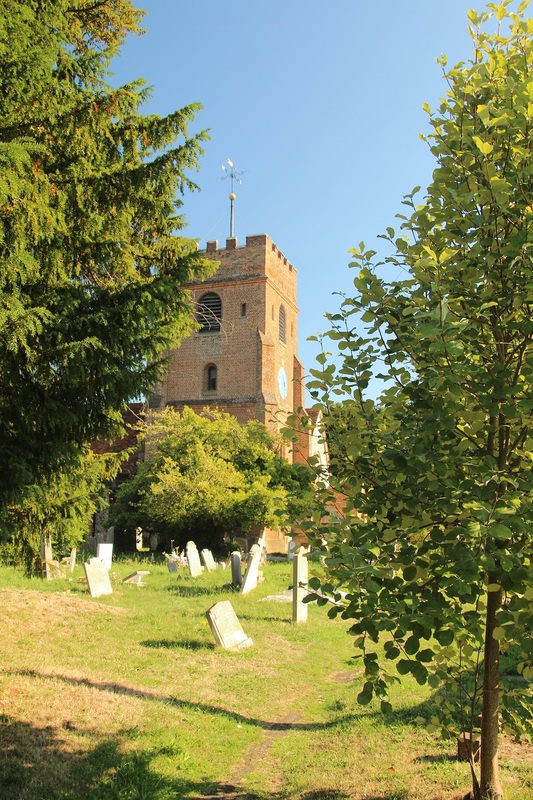 There was a church service and procession through the village and the Victoria Oak, a gift from the Duchess of Buccleuch, was planted on the village green. 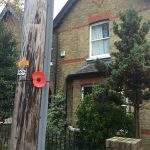 There was much rejoicing and singing of the national anthem and when the school children returned to school they were all given a Datchet medal on a blue ribbon. 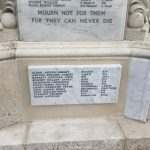 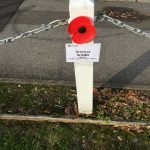 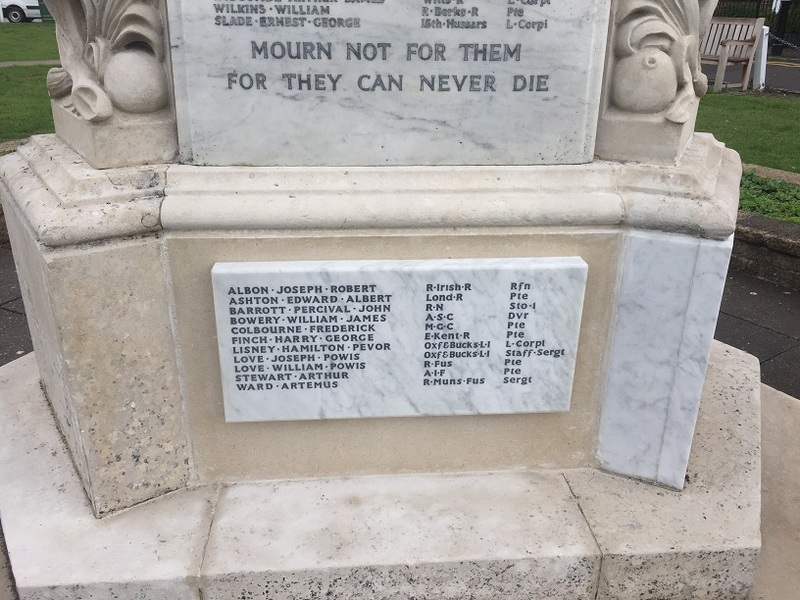 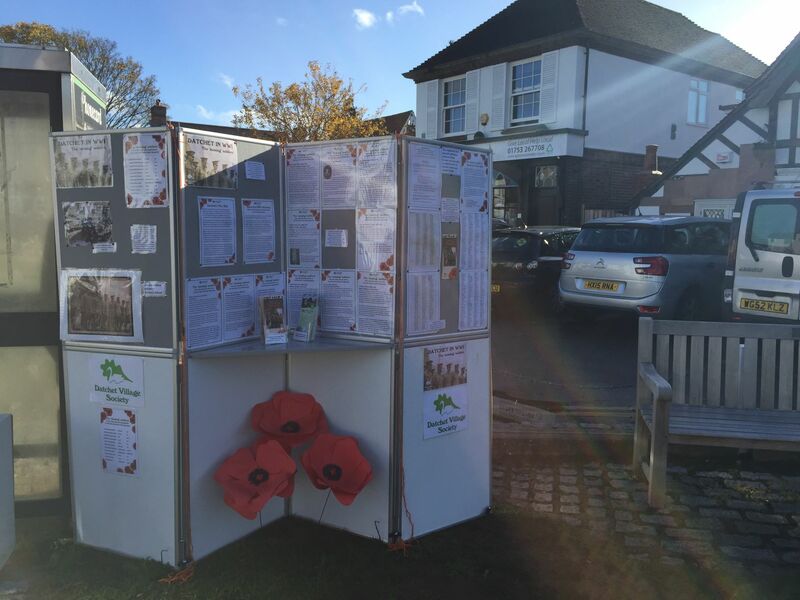 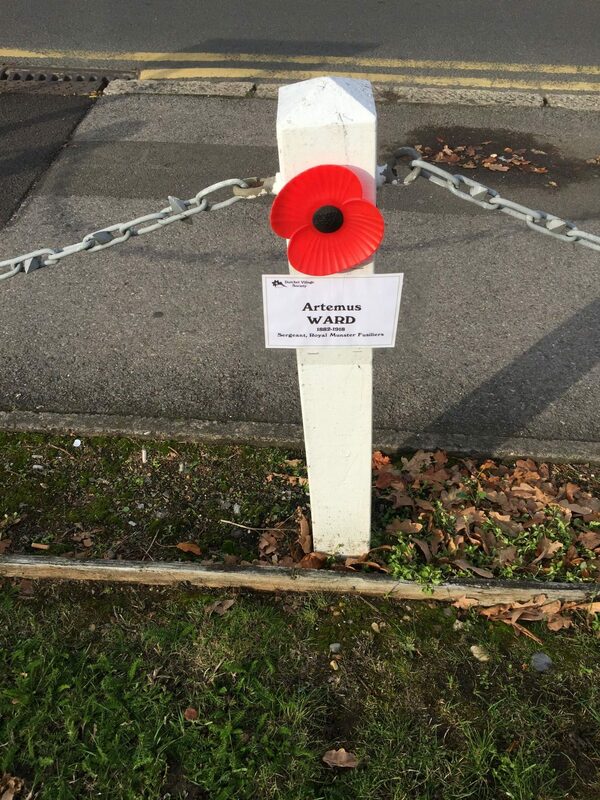 There was also a display of information about the ‘missing’ soldiers from Datchet’s War Memorial and the names we propose to add as part of the memorial restoration project. 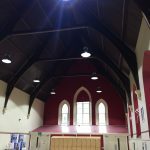 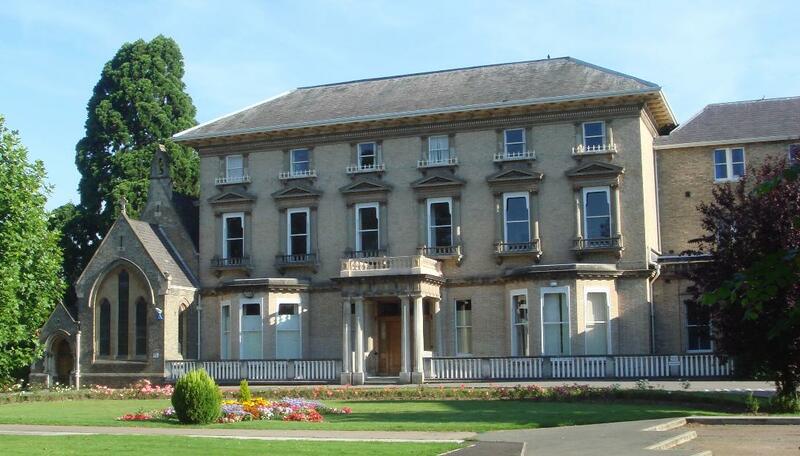 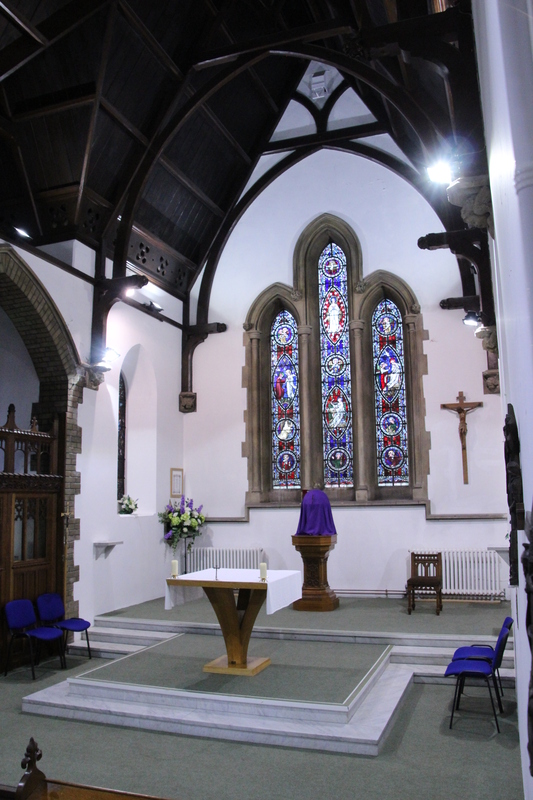 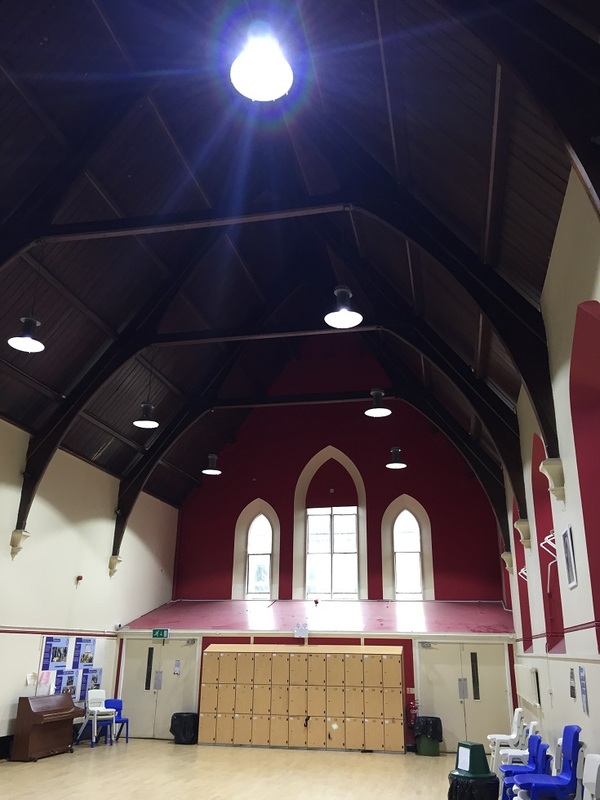 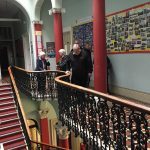 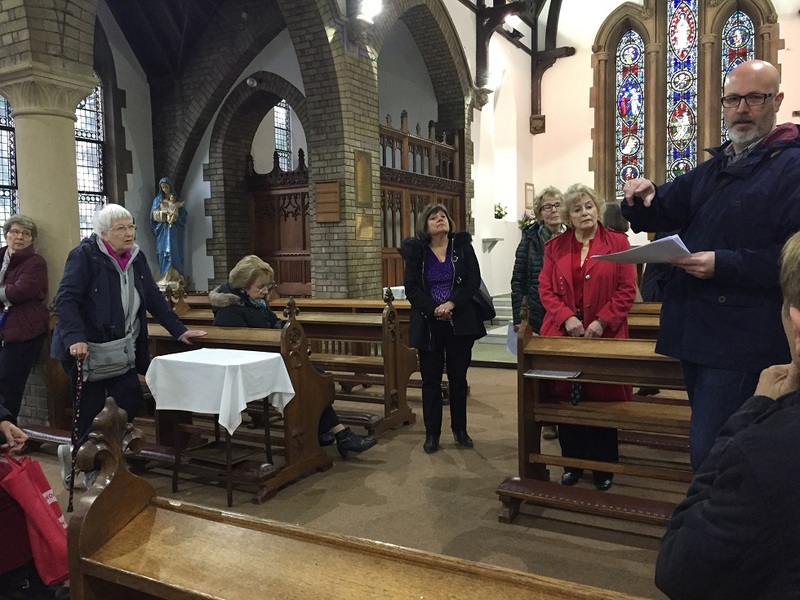 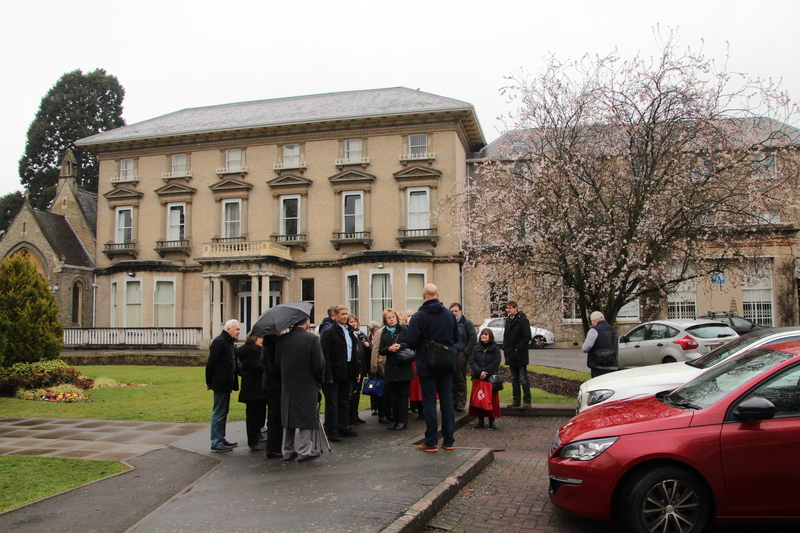 Our first visit of 2018, on 24 March, was to Aldin House and Chapel, two Grade II Listed buildings at St Bernard’s Catholic Grammar School in Slough. 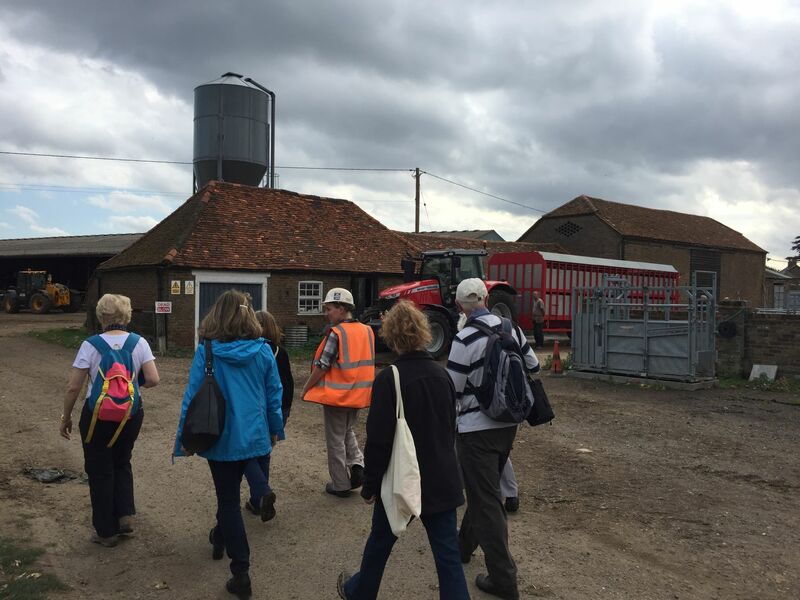 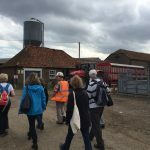 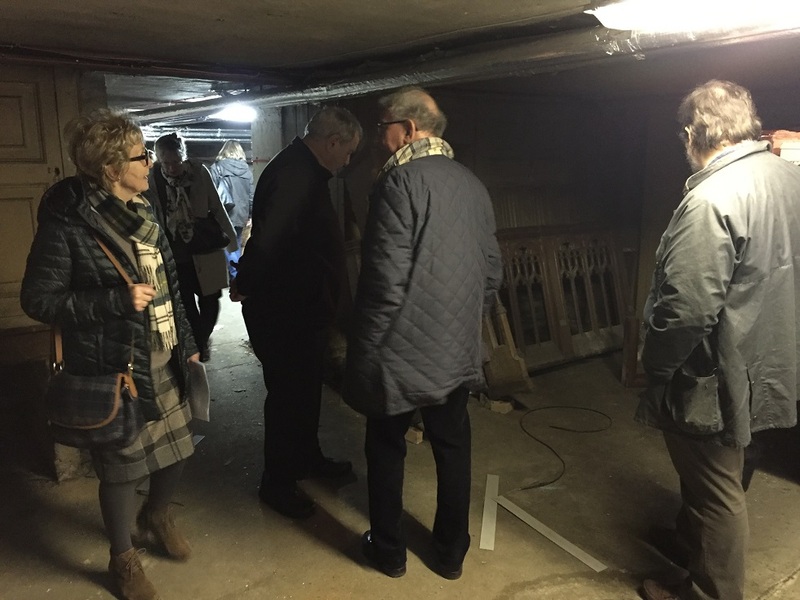 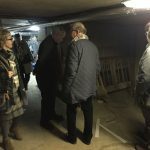 The site has a fascinating social, industrial, educational and architectural history, some published and some being currently researched and pieced together by DVS committee member and heritage designer Paul Bonnici-Waddingham, and Slough historian Tony Sargeant, both hosts of our visit. The original school was attended by Percy de Paravicini of Datchet, among others. 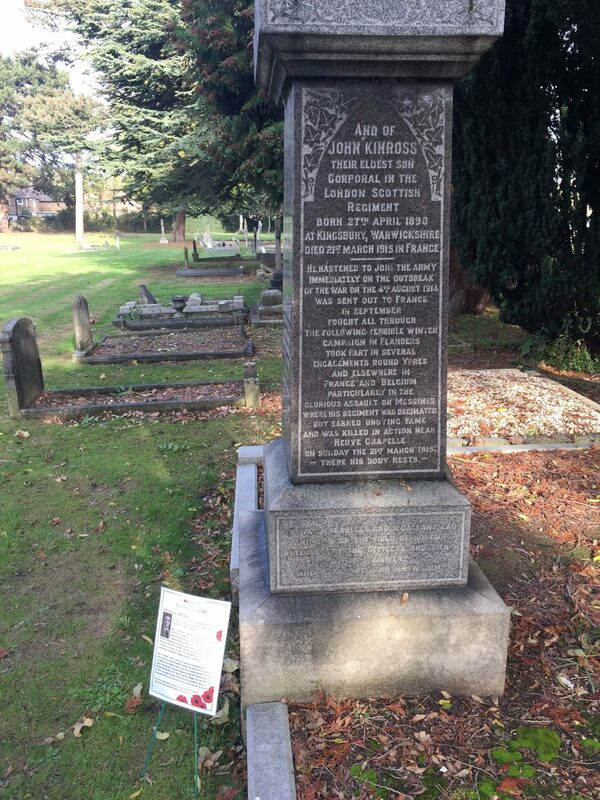 Jock Kinross of Riding Court also sent his daughters here. 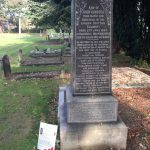 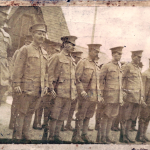 At the start of WWI, the school accommodated a Voluntary Aid Detachment Hospital where many Datchet women volunteered, helping to care for the wounded soldiers. 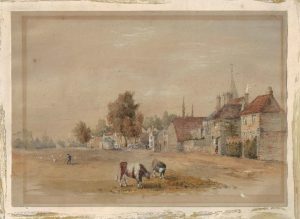 Links to the village continue to this day. 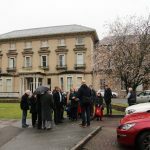 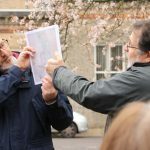 Our visit began in the front grounds of the school where the Dolphin Inn once stood, on the important London to Bath mail-coach run, and where ‘pleasure gardens’ attracted day visitors to an otherwise agricultural area. 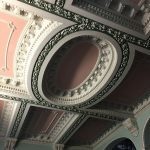 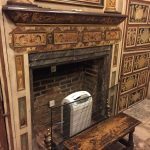 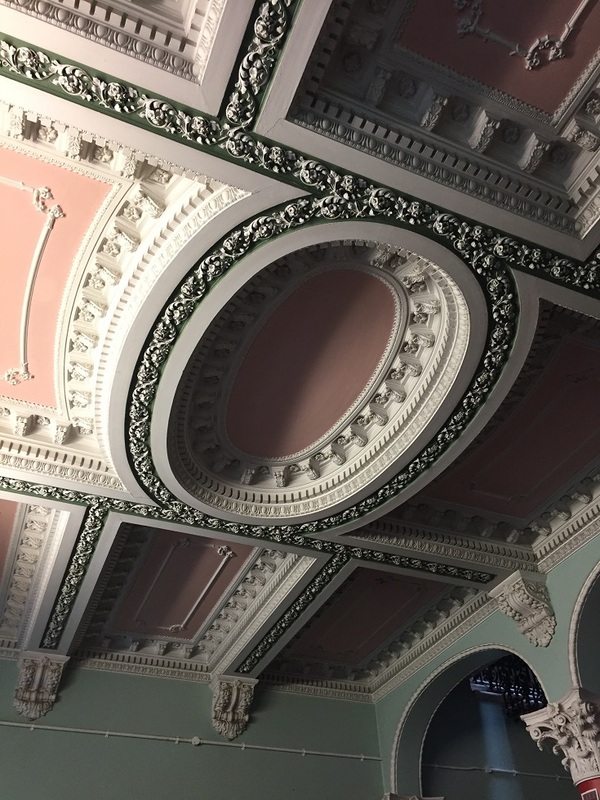 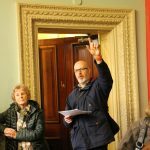 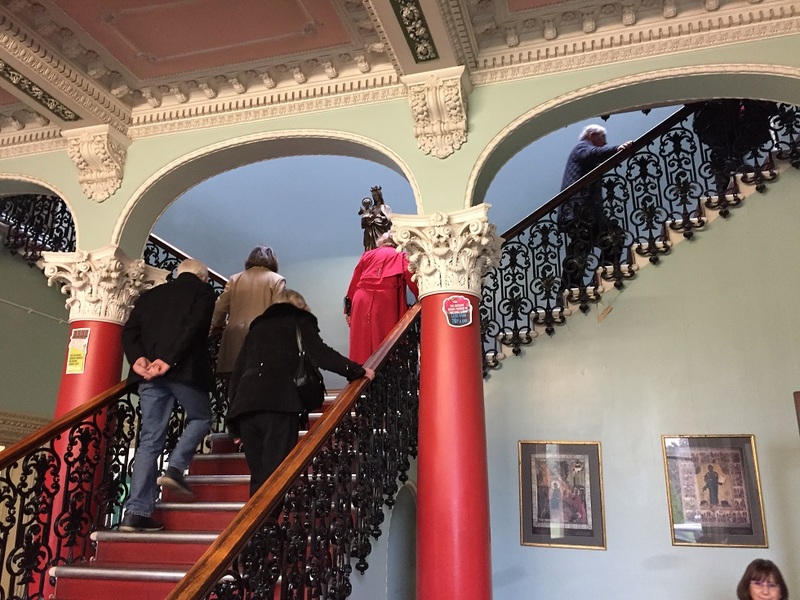 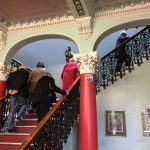 We then explored the lower floors of Aldin House, a fine example of mid-Victorian Italianate architecture which was built prospectively in the 1860s as a private residence using bricks made on the grounds. 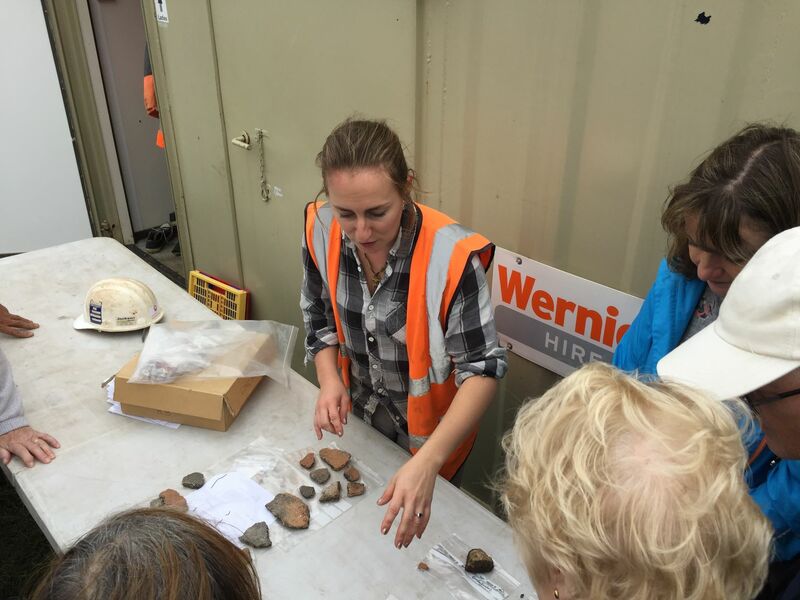 (At the time brickworks were a major local industry.) 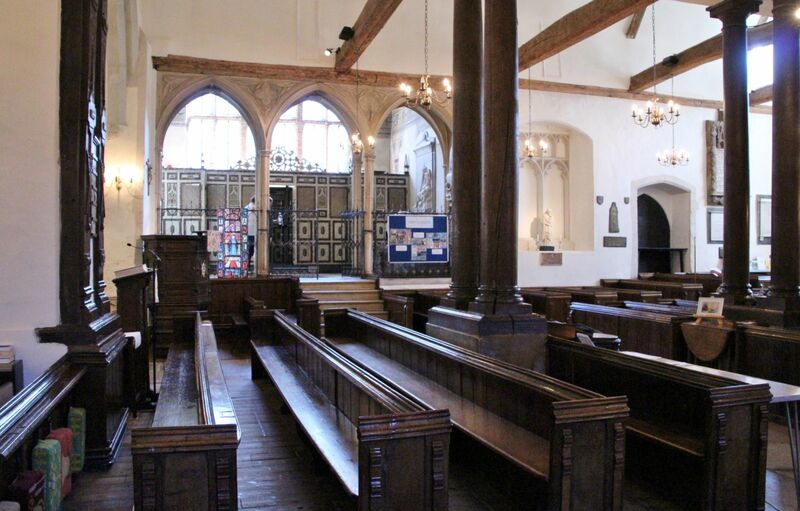 Within a few years of being completed, the still unoccupied house and grounds were leased to an Eton Master to create a preparatory school for younger Etonians – St Michael’s – resulting in further development of the site and the loss of the Inn. 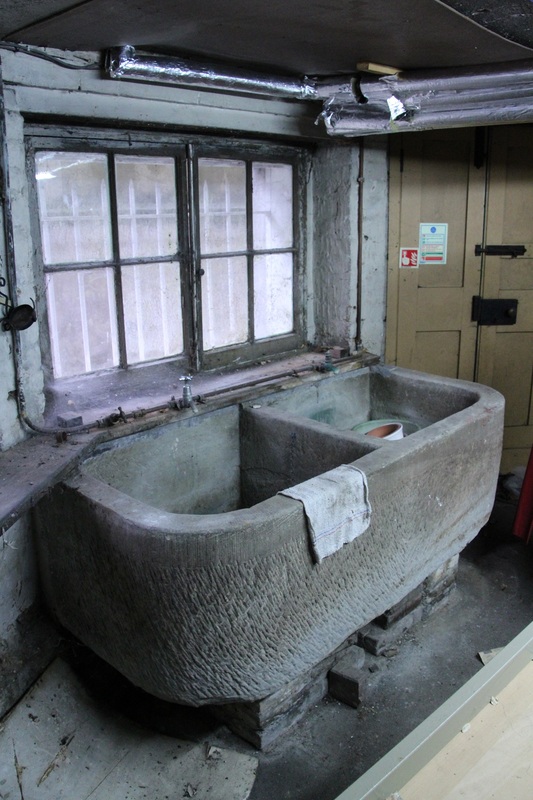 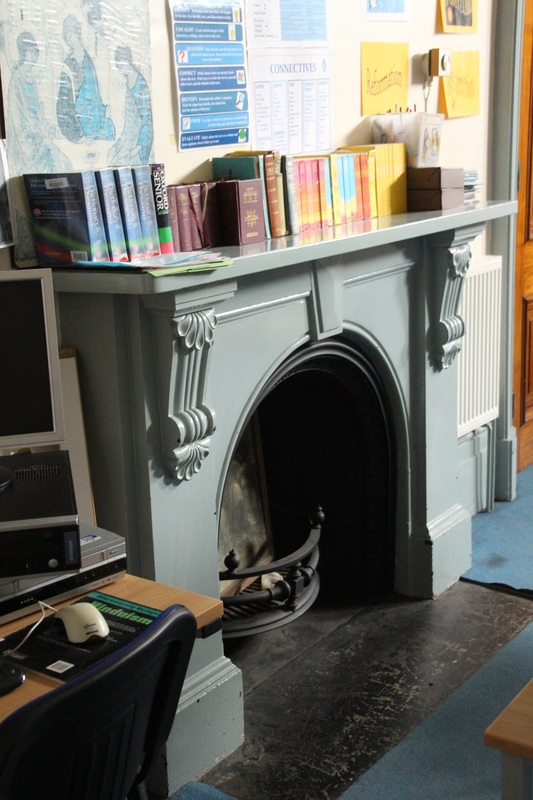 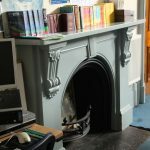 This marked the beginnings of the site’s heritage in education provision. 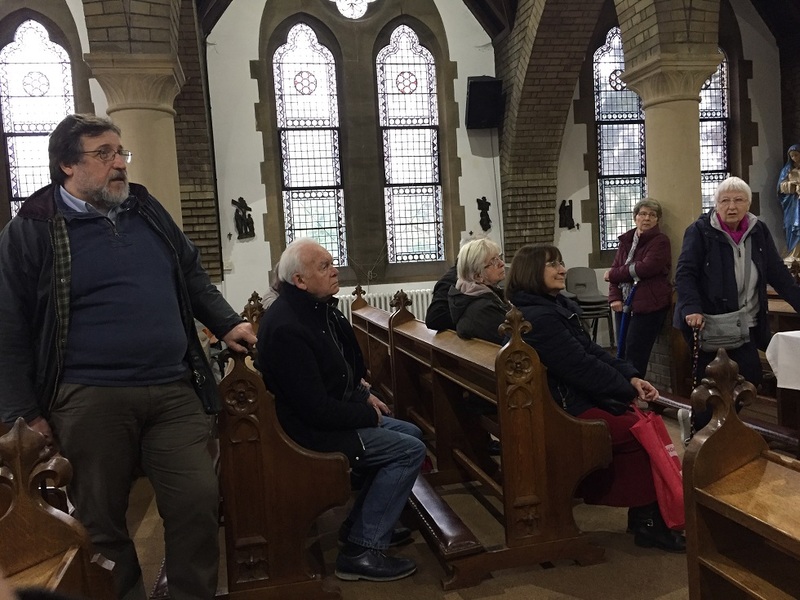 The chapel, the next part of our tour, bookends the extended range of buildings to the west and has been attributed to the architect Gilbert Scott with later extension by Alfred Waterhouse, designer of London’s Natural History Museum. 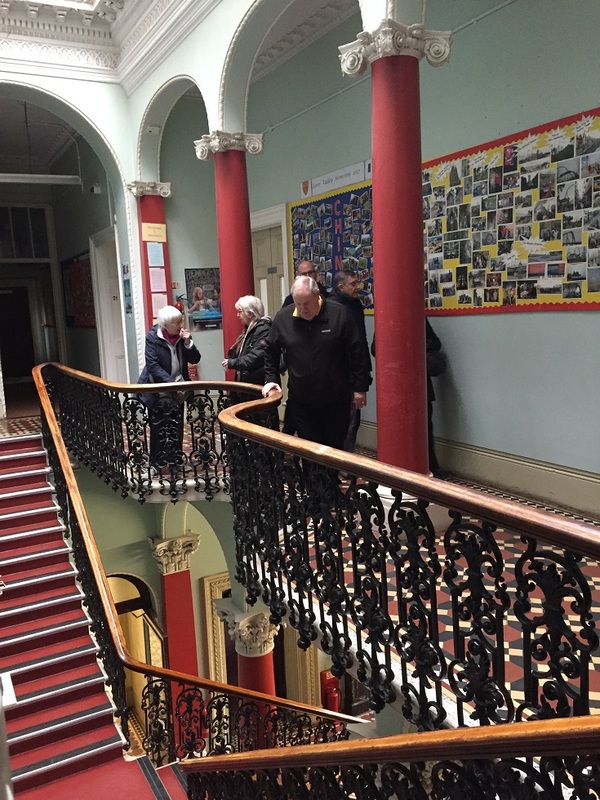 We then headed back into Aldin House, to explore the basement and the upper floors, and finished our visit with a refreshments in the hall.